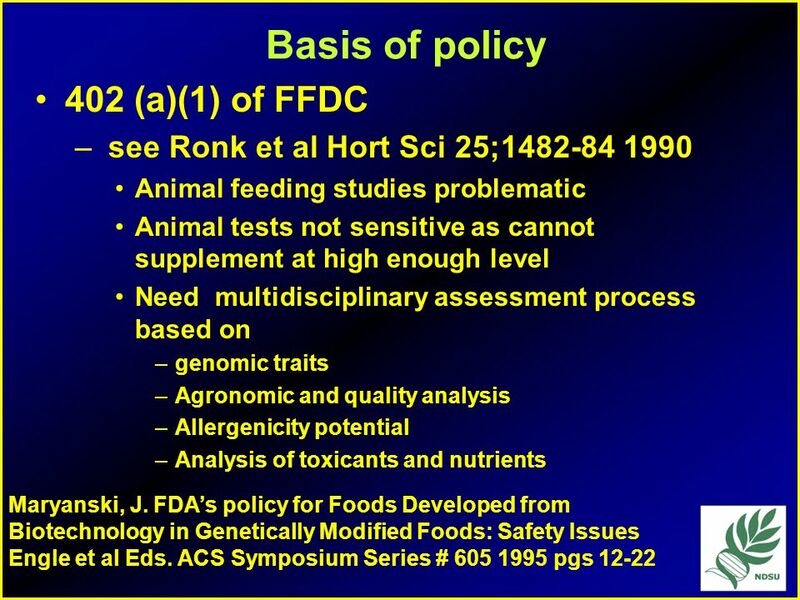 Department of Food Science and Nutrition Univ. 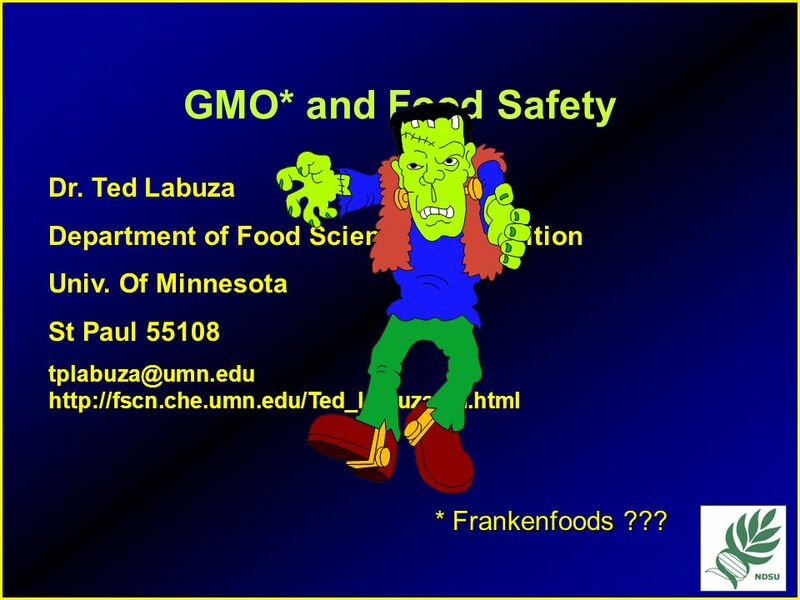 Of Minnesota St Paul 55108 * Frankenfoods ??? 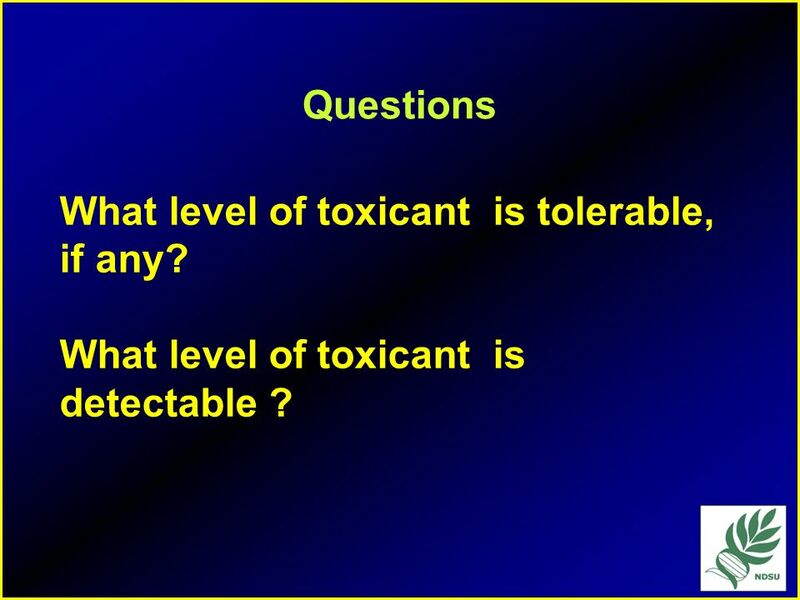 13 Questions What level of toxicant is tolerable, if any? 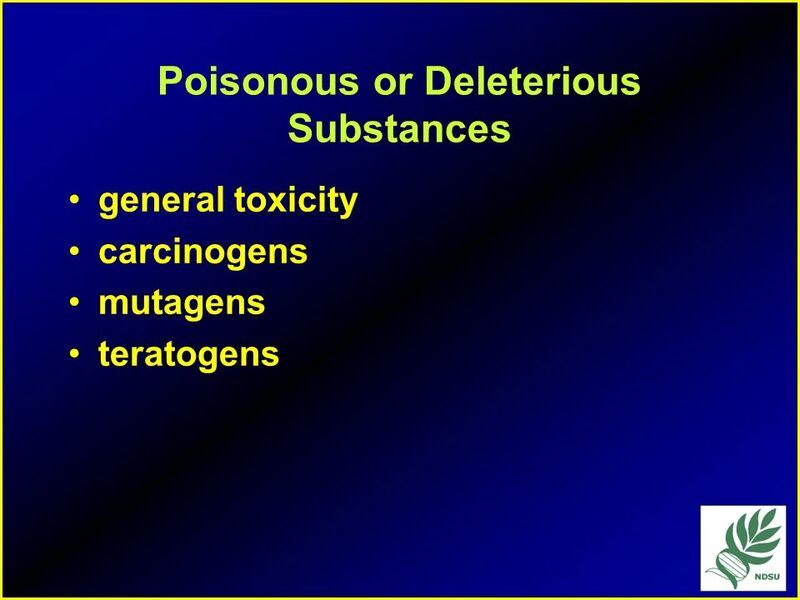 What level of toxicant is detectable ? 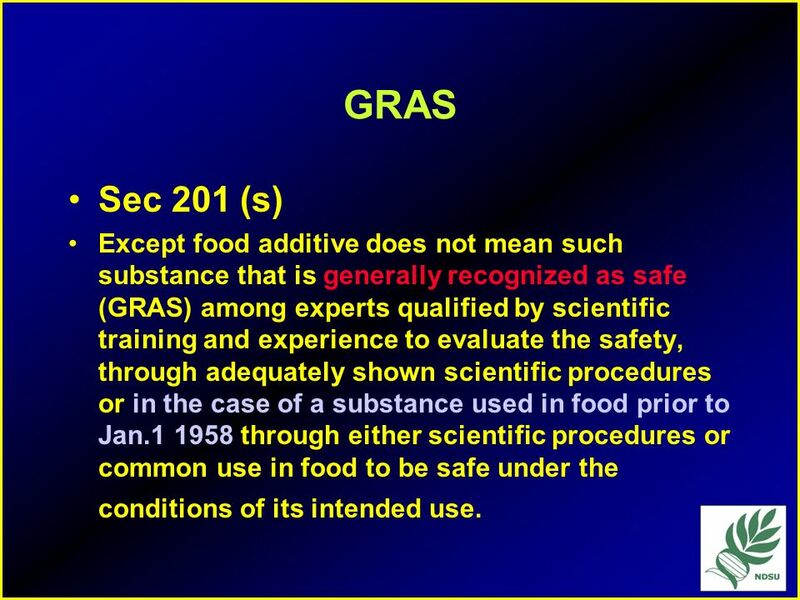 21 GRAS Sec 201 (s) Except food additive does not mean such substance that is generally recognized as safe (GRAS) among experts qualified by scientific training and experience to evaluate the safety, through adequately shown scientific procedures or in the case of a substance used in food prior to Jan through either scientific procedures or common use in food to be safe under the conditions of its intended use. 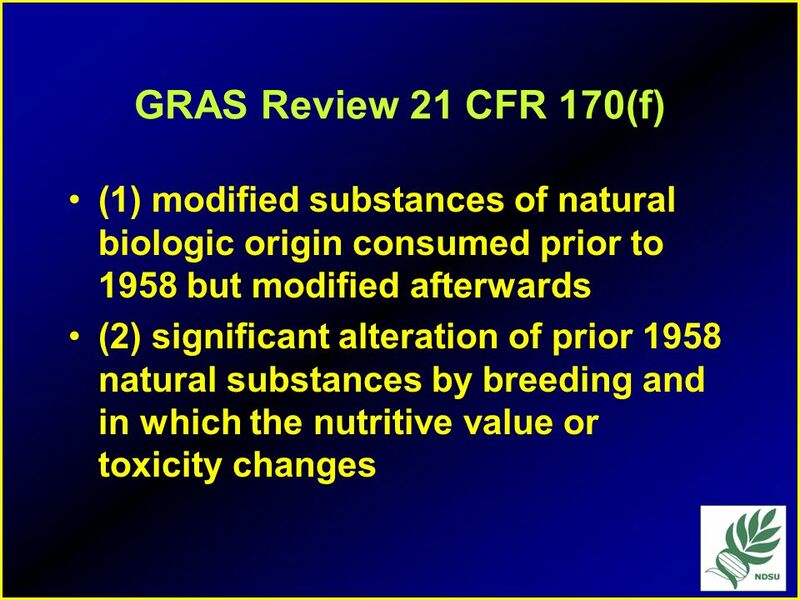 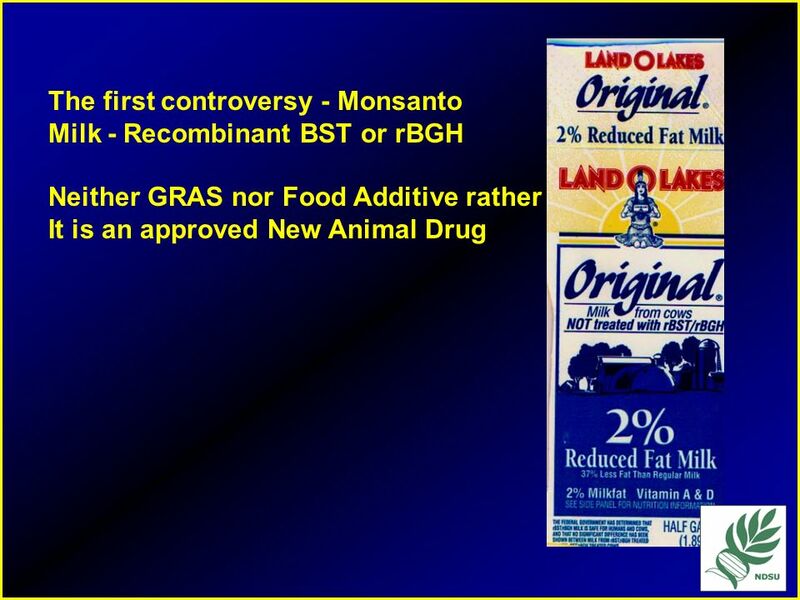 27 The Issues What category of food ingredients do GMO based varieties it into ? 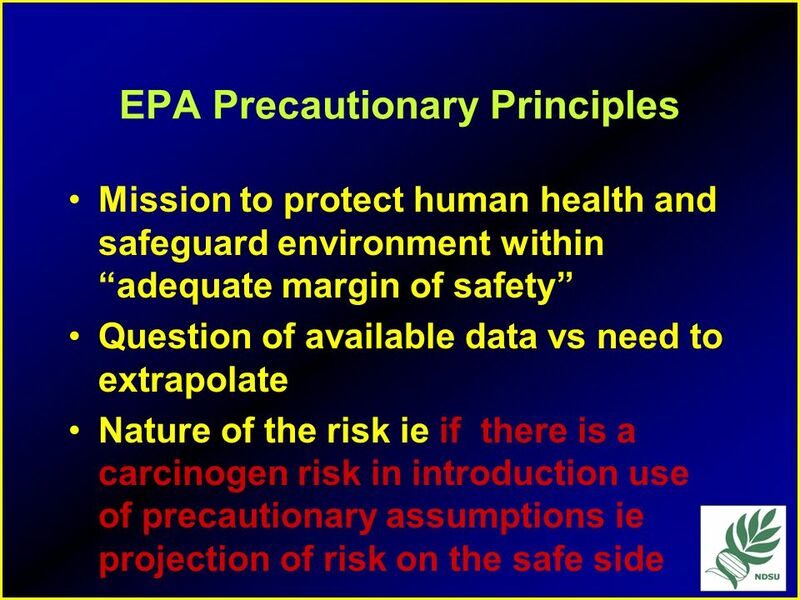 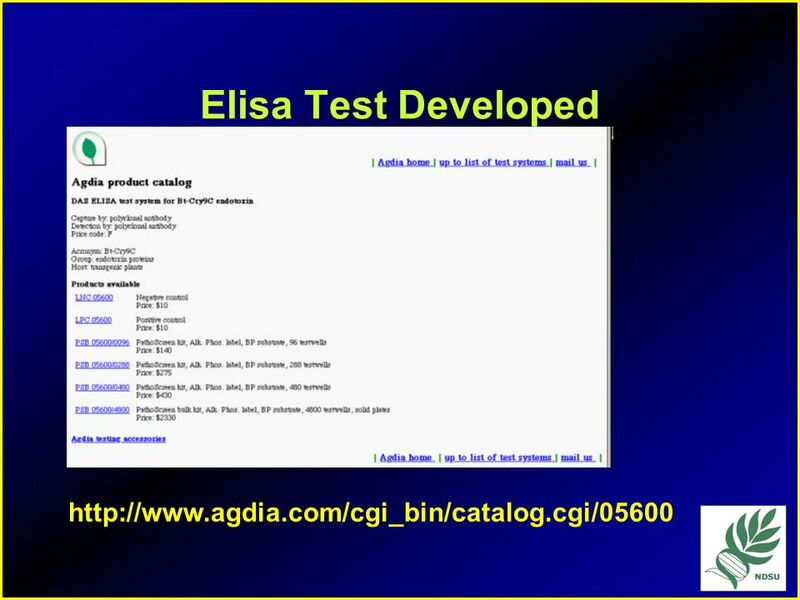 What safety criteria are needed in testing, ie what are the protocols ? 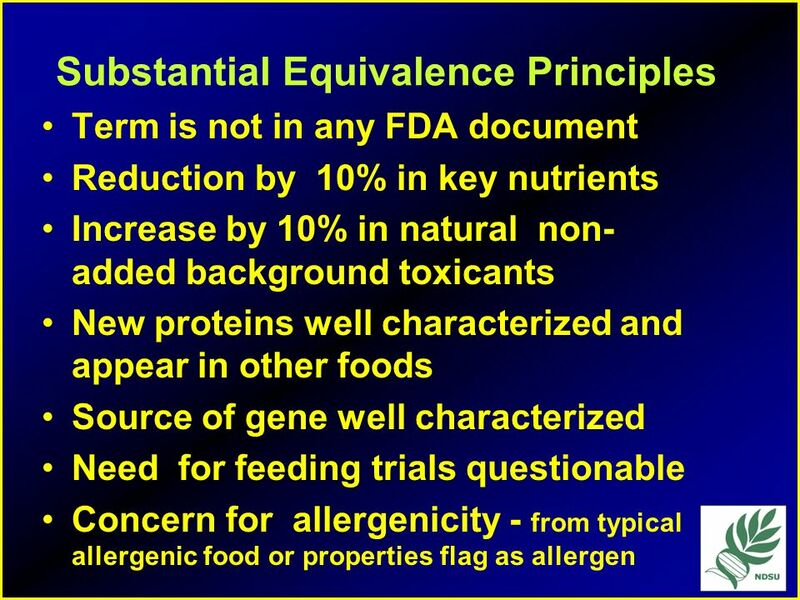 What does substantial equivalence mean? 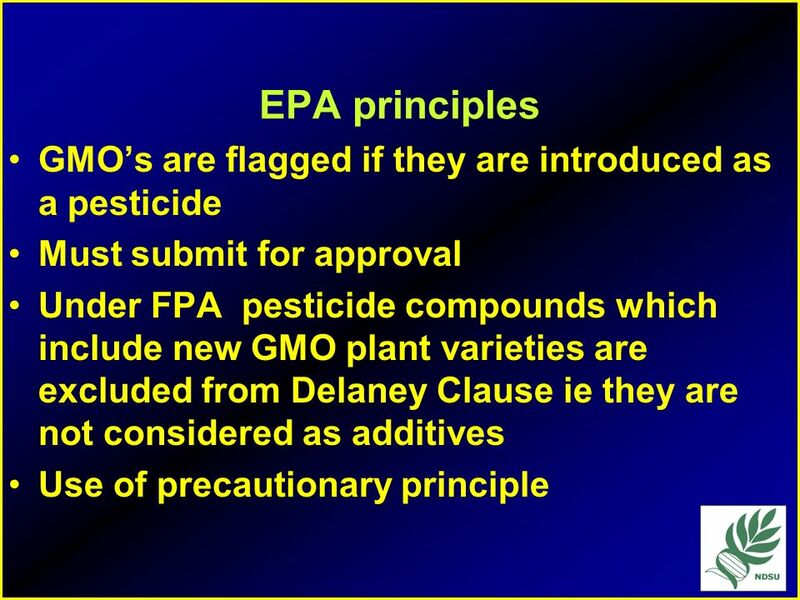 What does “precautionary principal mean? 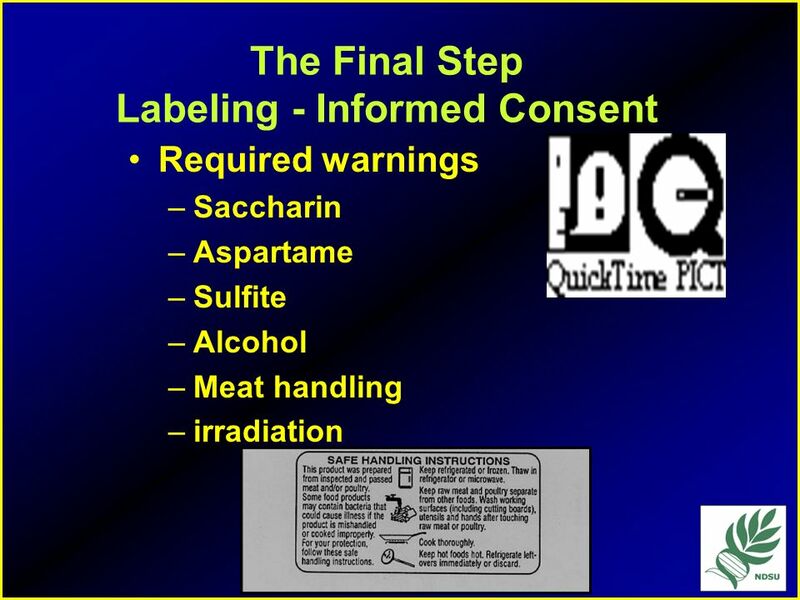 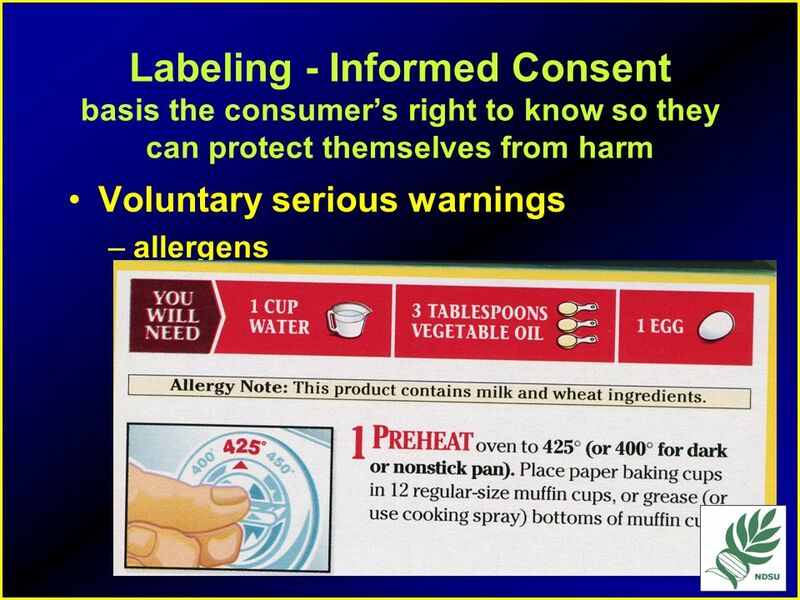 First, food safety and labeling-the editorial says let's state once and for all that safety and labeling standards for foods, food ingredients, and feeds should be applied regardless of the techniques used in their production and manufacture. 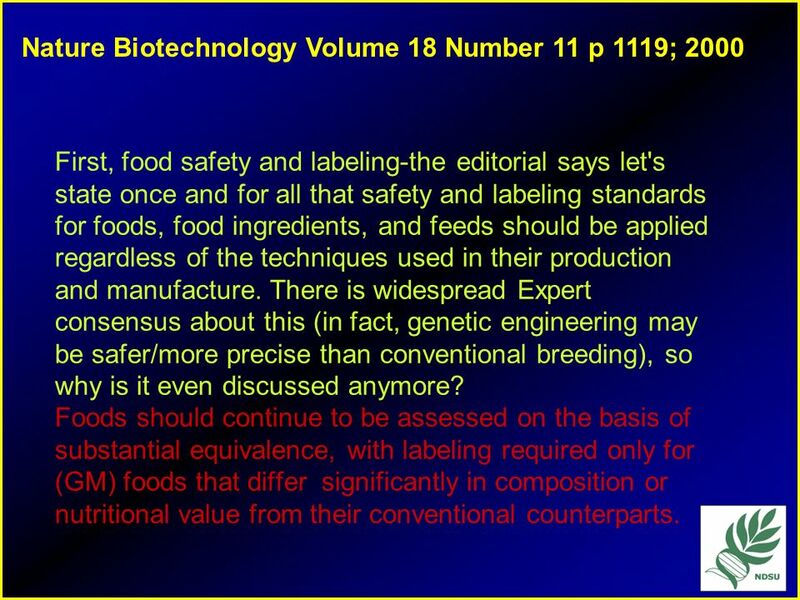 There is widespread Expert consensus about this (in fact, genetic engineering may be safer/more precise than conventional breeding), so why is it even discussed anymore? 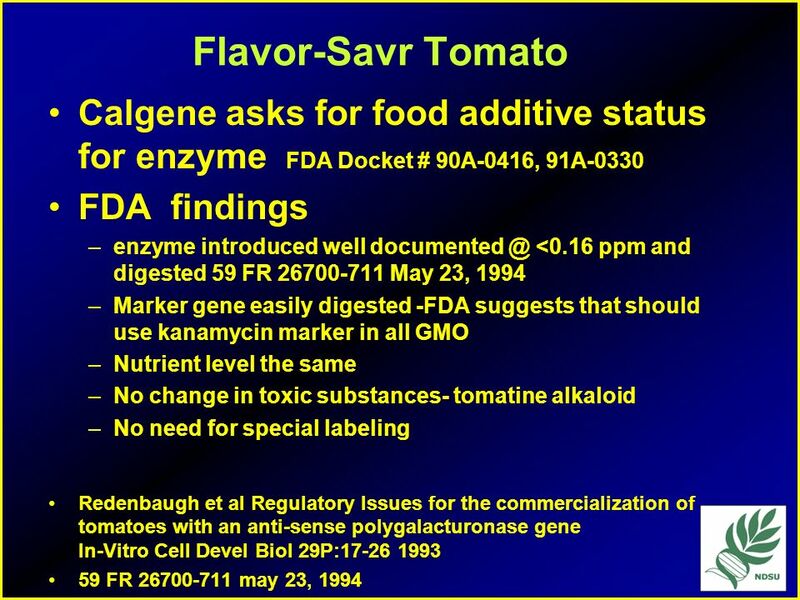 Foods should continue to be assessed on the basis of substantial equivalence, with labeling required only for (GM) foods that differ significantly in composition or nutritional value from their conventional counterparts. 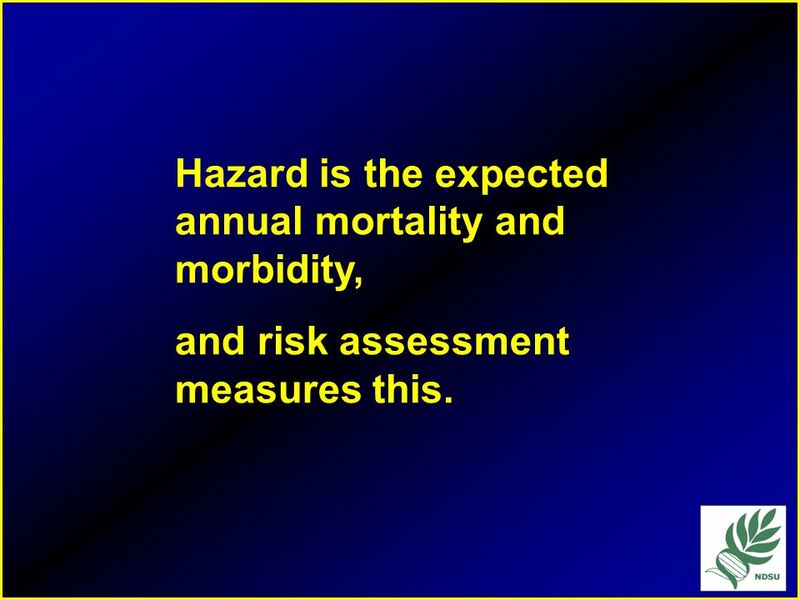 and risk assessment measures this. 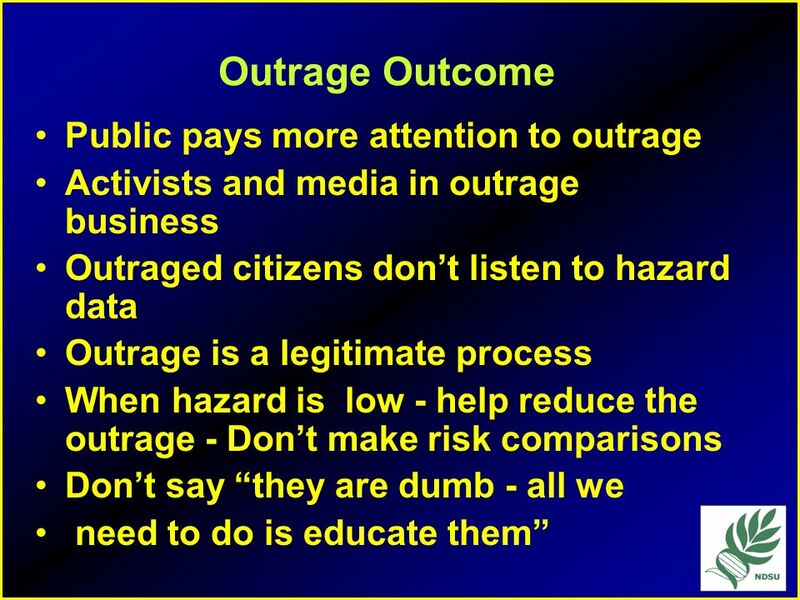 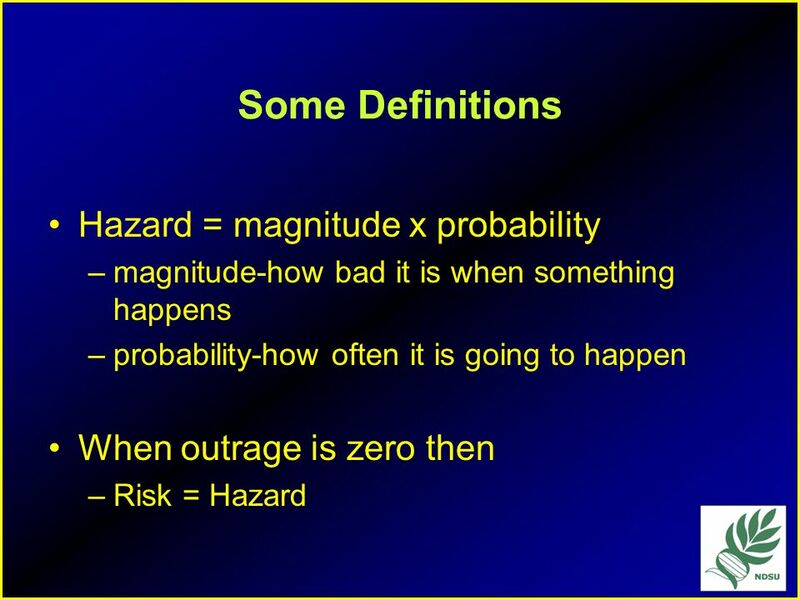 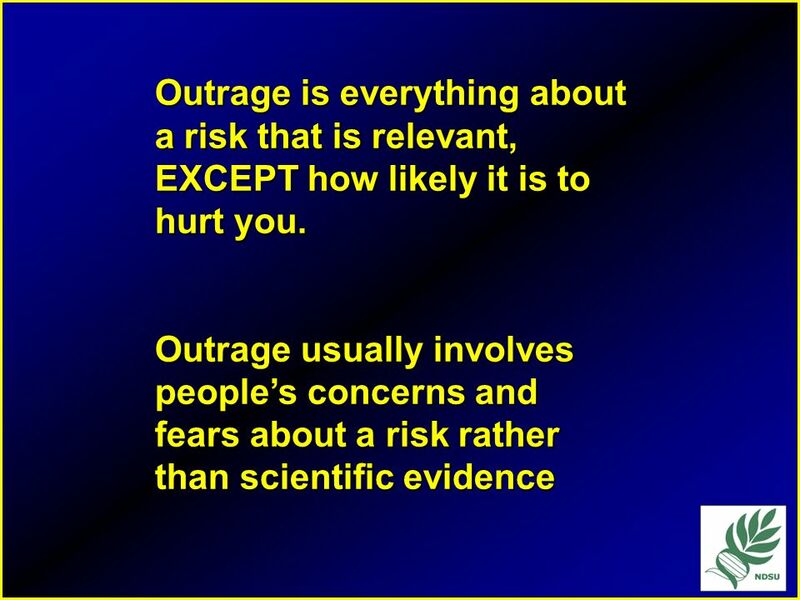 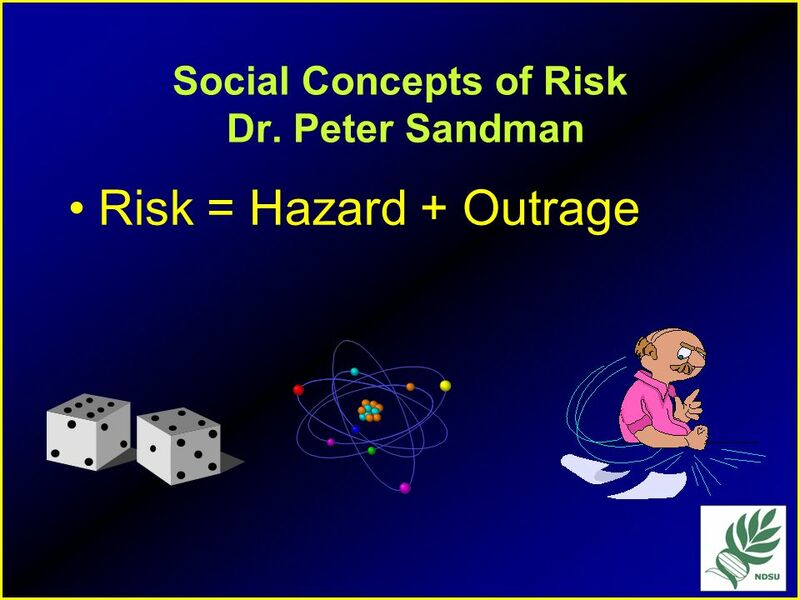 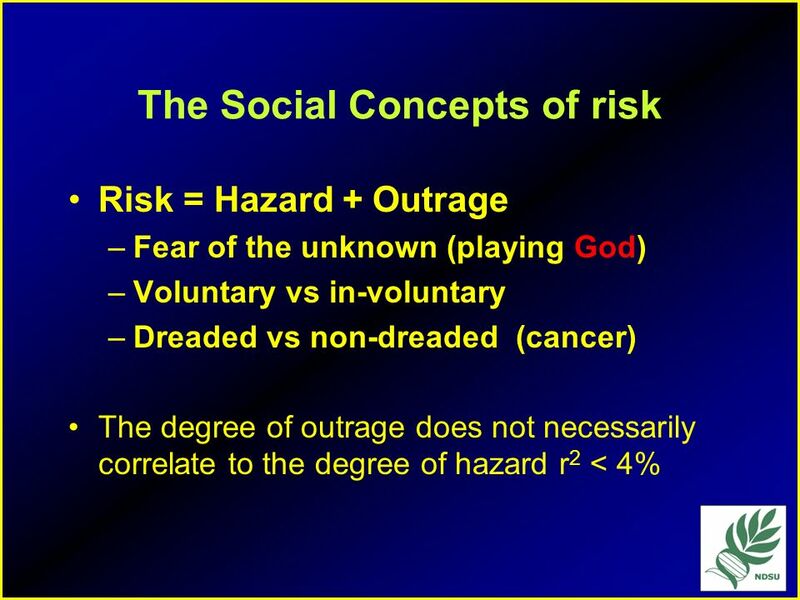 56 Outrage is everything about a risk that is relevant, EXCEPT how likely it is to hurt you. 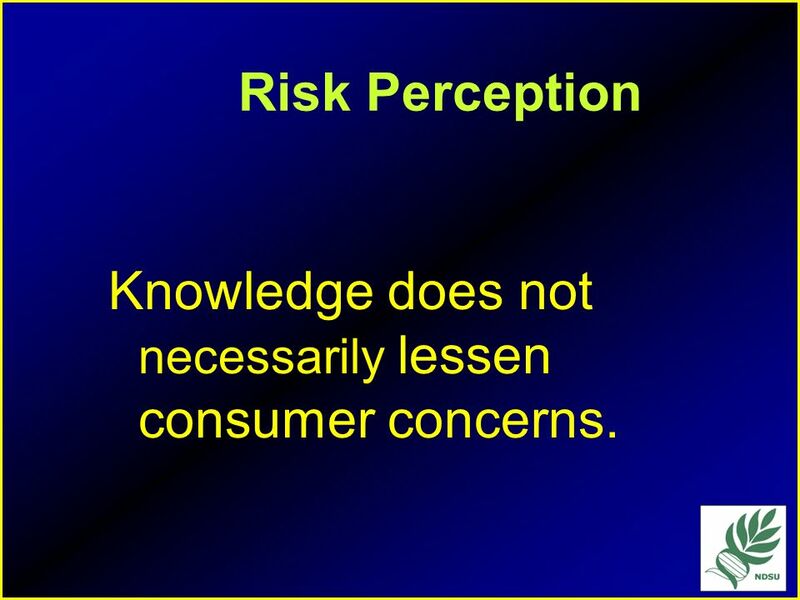 61 Risk Perception Knowledge does not necessarily lessen consumer concerns. 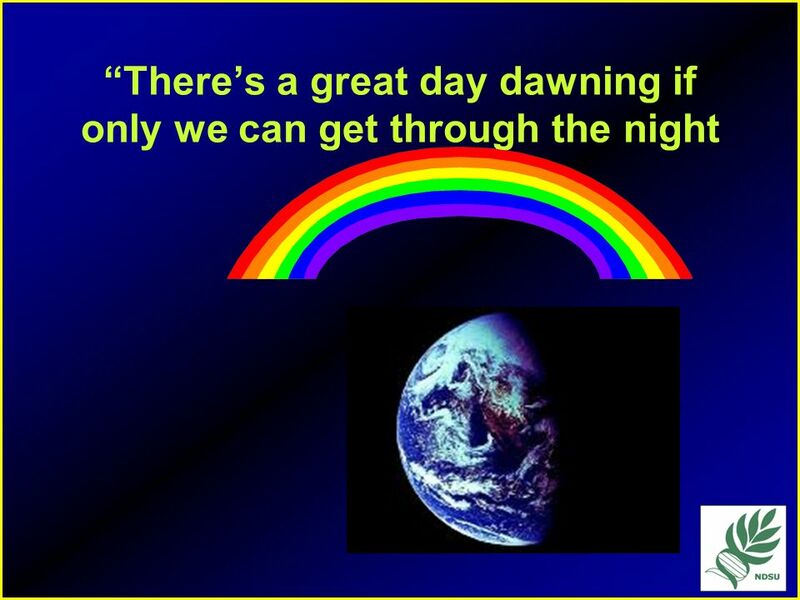 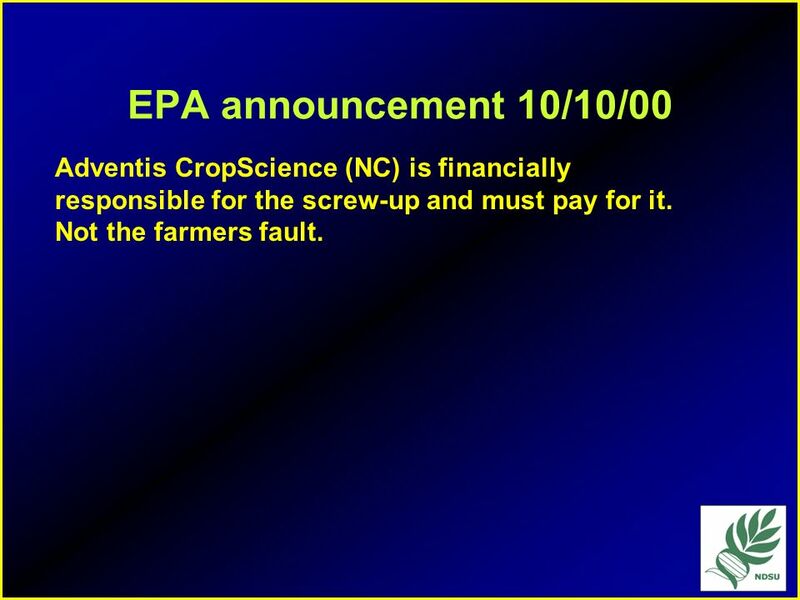 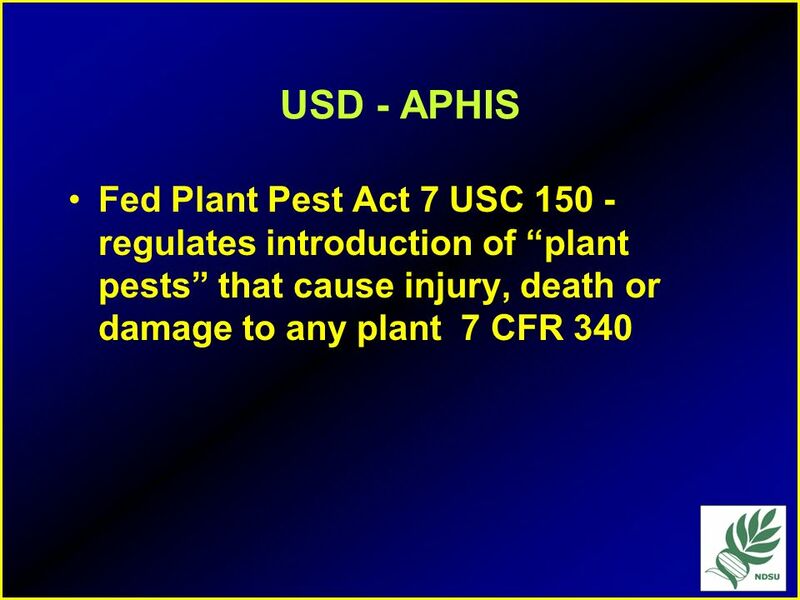 71 EPA announcement 10/10/00 Adventis CropScience (NC) is financially responsible for the screw-up and must pay for it. 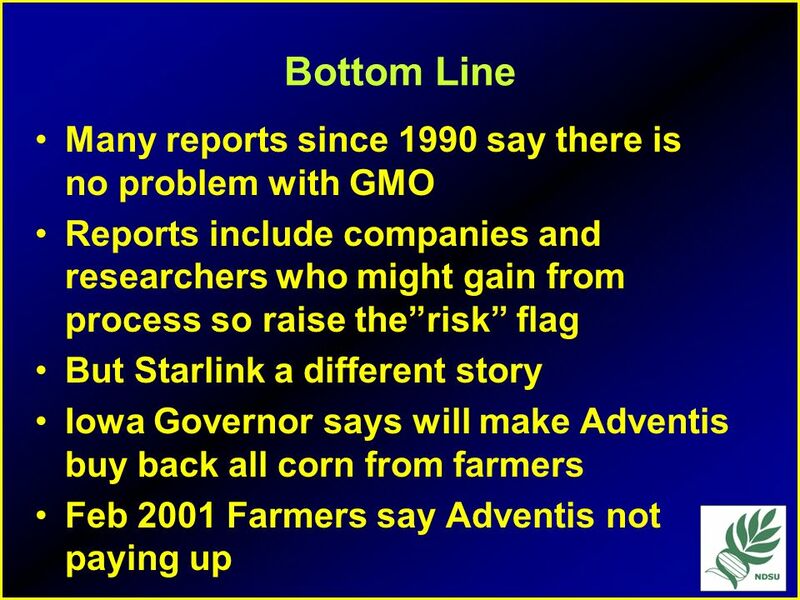 Not the farmers fault. 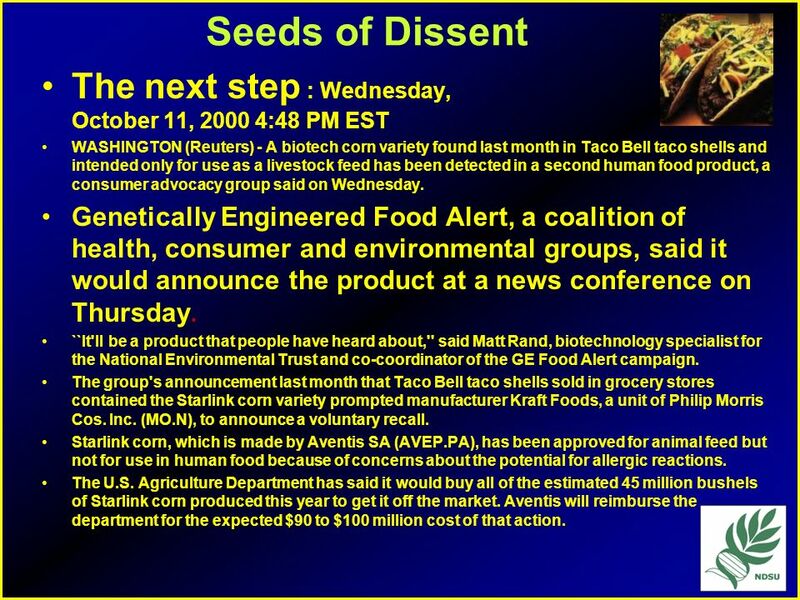 72 Seeds of Dissent The next step : Wednesday, October 11, :48 PM EST WASHINGTON (Reuters) - A biotech corn variety found last month in Taco Bell taco shells and intended only for use as a livestock feed has been detected in a second human food product, a consumer advocacy group said on Wednesday. 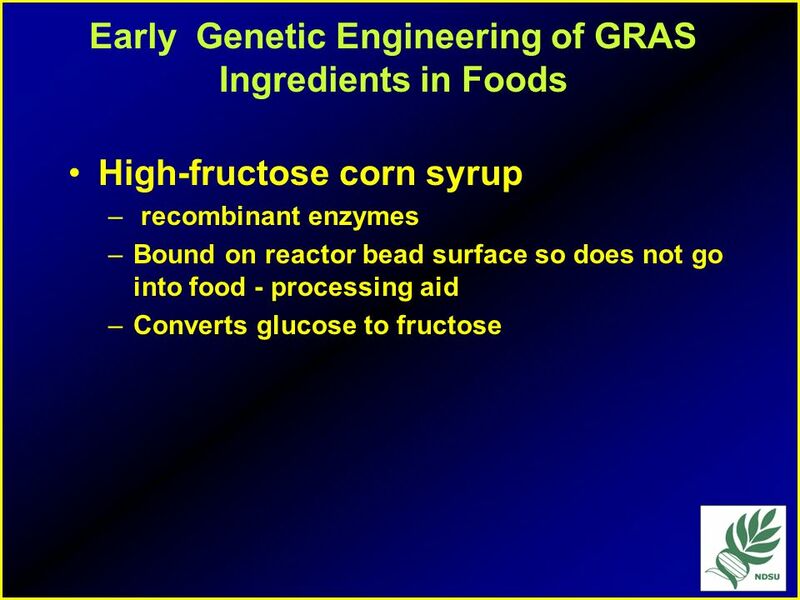 Genetically Engineered Food Alert, a coalition of health, consumer and environmental groups, said it would announce the product at a news conference on Thursday. 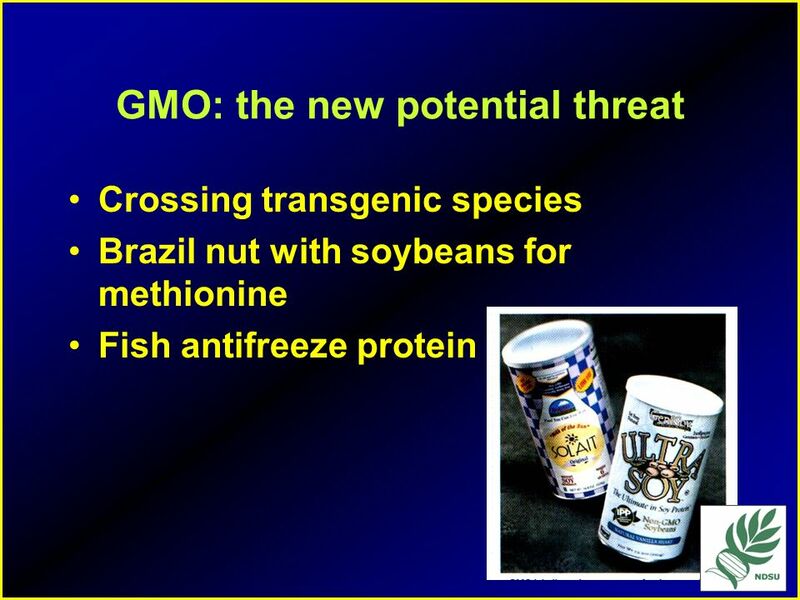 ``It'll be a product that people have heard about,'' said Matt Rand, biotechnology specialist for the National Environmental Trust and co-coordinator of the GE Food Alert campaign. 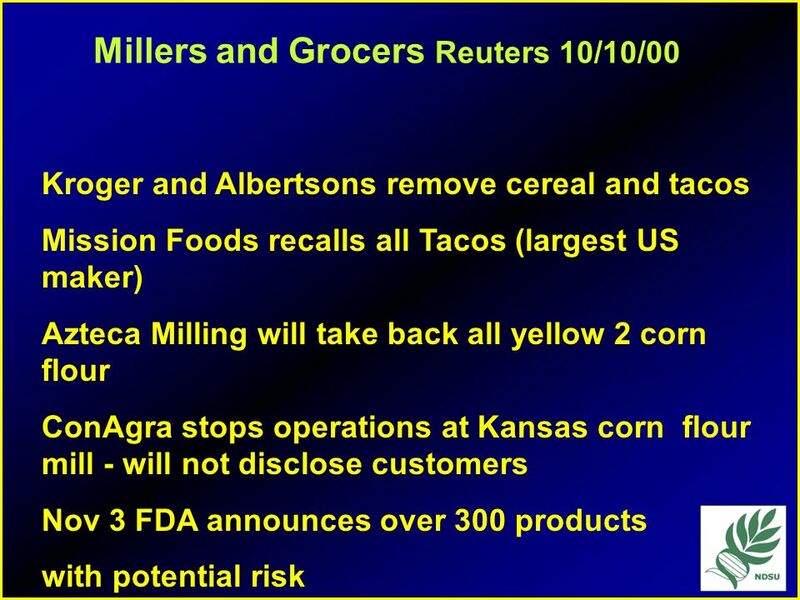 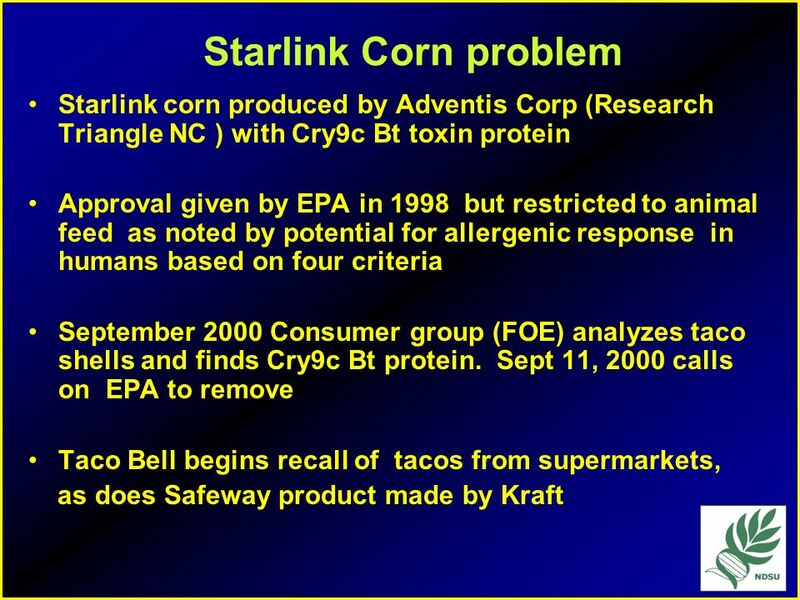 The group's announcement last month that Taco Bell taco shells sold in grocery stores contained the Starlink corn variety prompted manufacturer Kraft Foods, a unit of Philip Morris Cos. Inc. (MO.N), to announce a voluntary recall. 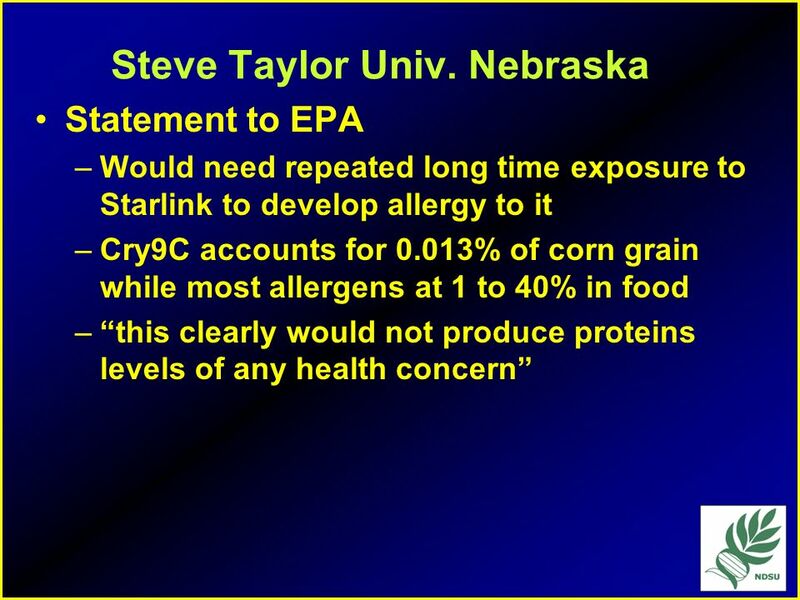 Starlink corn, which is made by Aventis SA (AVEP.PA), has been approved for animal feed but not for use in human food because of concerns about the potential for allergic reactions. 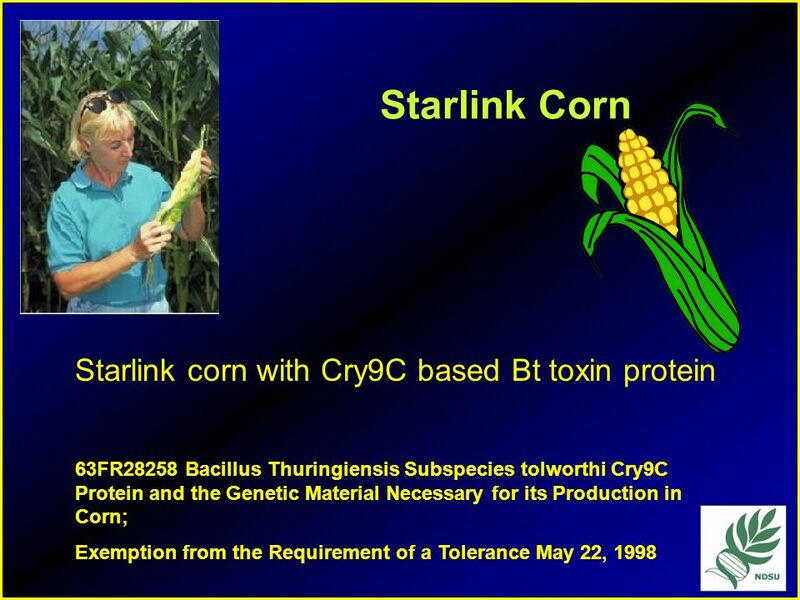 The U.S. Agriculture Department has said it would buy all of the estimated 45 million bushels of Starlink corn produced this year to get it off the market. 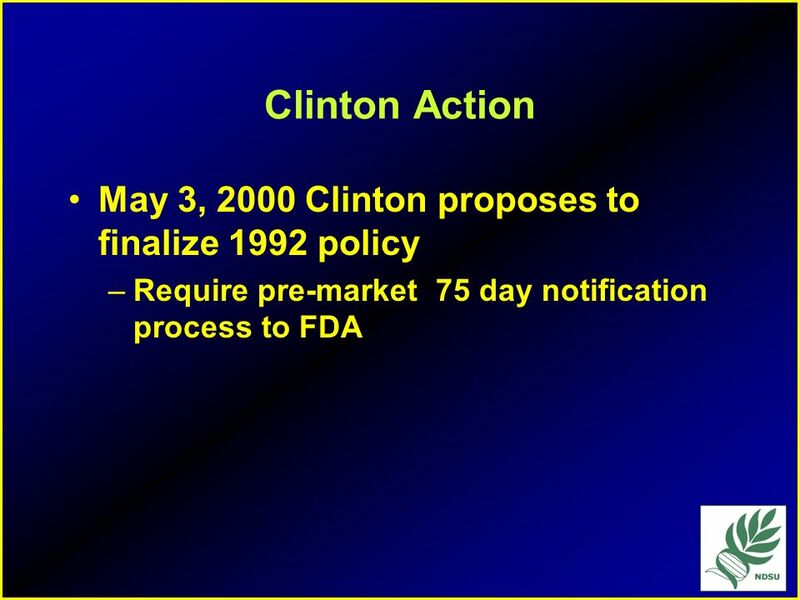 Aventis will reimburse the department for the expected $90 to $100 million cost of that action. 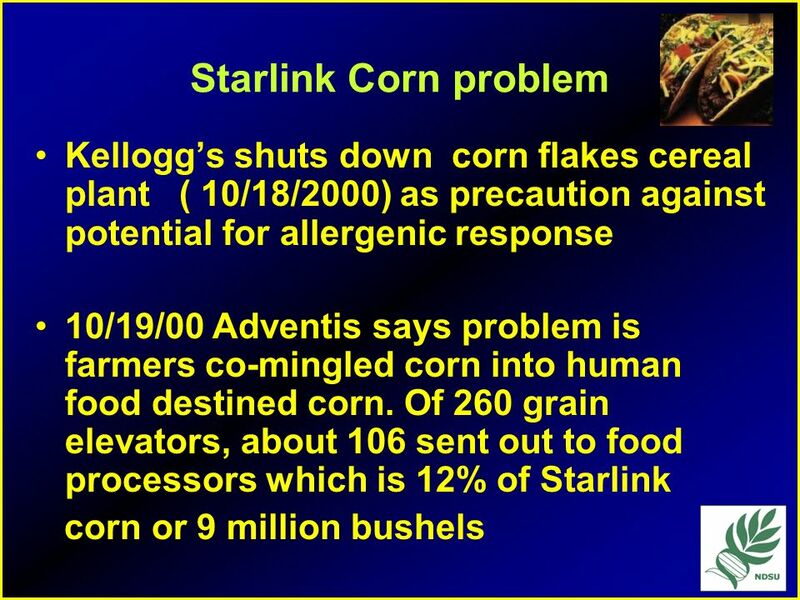 Fred Rosenberger, who grew 40 acres of StarLink corn in Rineyville, Ky.,this year, was quoted as saying, "We never found out until two weeks ago,"adding that because he stored the corn before realizing that it should be segregated, some 8,000 bushels of StarLink corn were mixed in with about 42,000 bushels of other varieties. 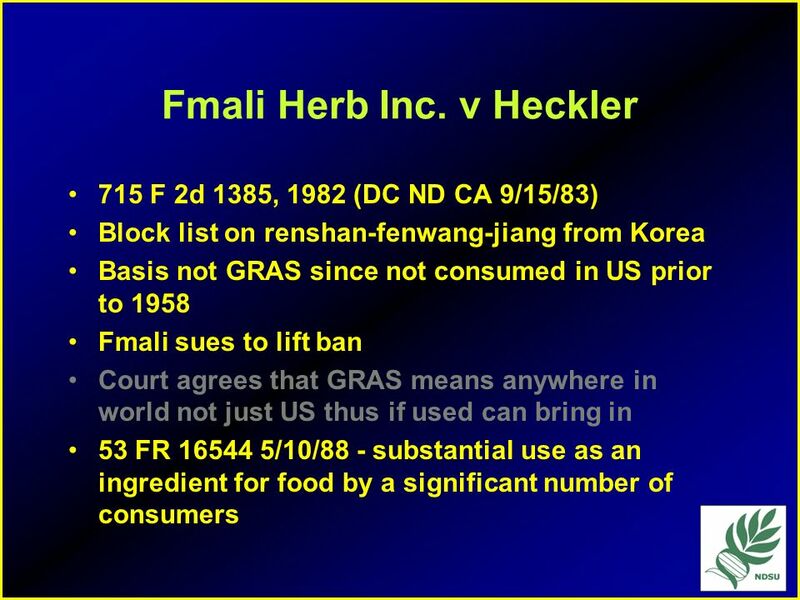 Mr. Rosenberger said that some neighbors,whom he declined to name, had unwittingly shipped it to local elevators. 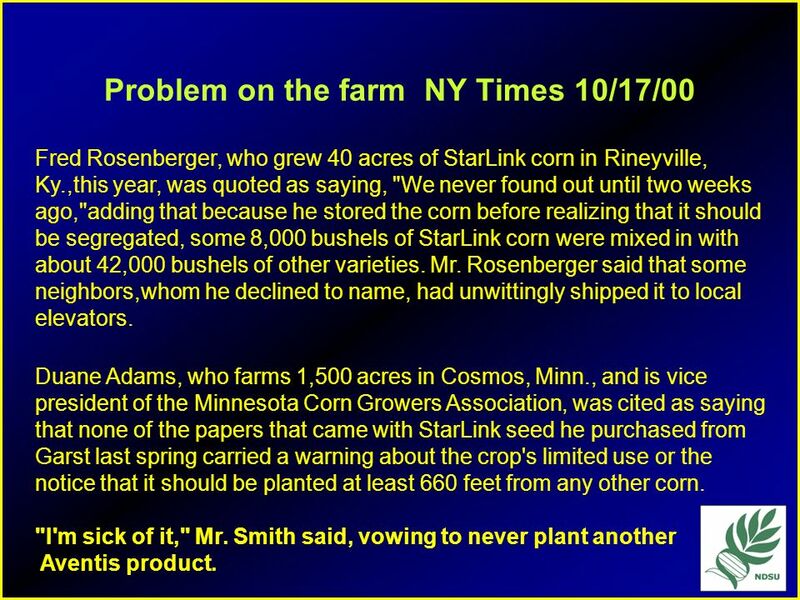 Duane Adams, who farms 1,500 acres in Cosmos, Minn., and is vice president of the Minnesota Corn Growers Association, was cited as saying that none of the papers that came with StarLink seed he purchased from Garst last spring carried a warning about the crop's limited use or the notice that it should be planted at least 660 feet from any other corn. 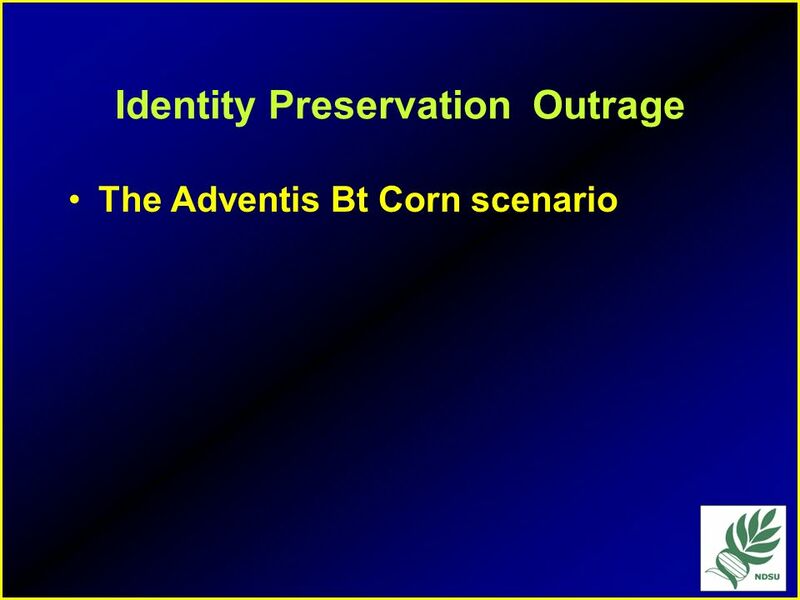 "I'm sick of it," Mr. Smith said, vowing to never plant another Aventis product. 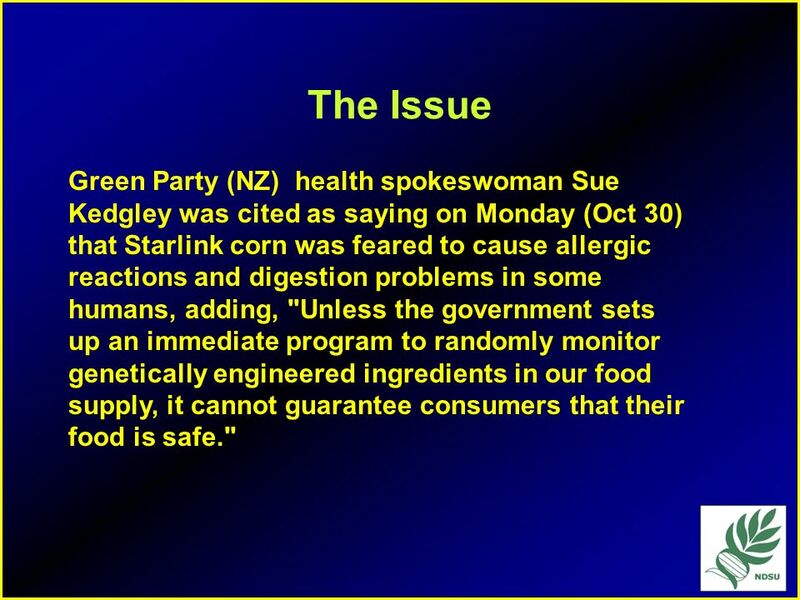 76 The Issue Green Party (NZ) health spokeswoman Sue Kedgley was cited as saying on Monday (Oct 30) that Starlink corn was feared to cause allergic reactions and digestion problems in some humans, adding, "Unless the government sets up an immediate program to randomly monitor genetically engineered ingredients in our food supply, it cannot guarantee consumers that their food is safe." 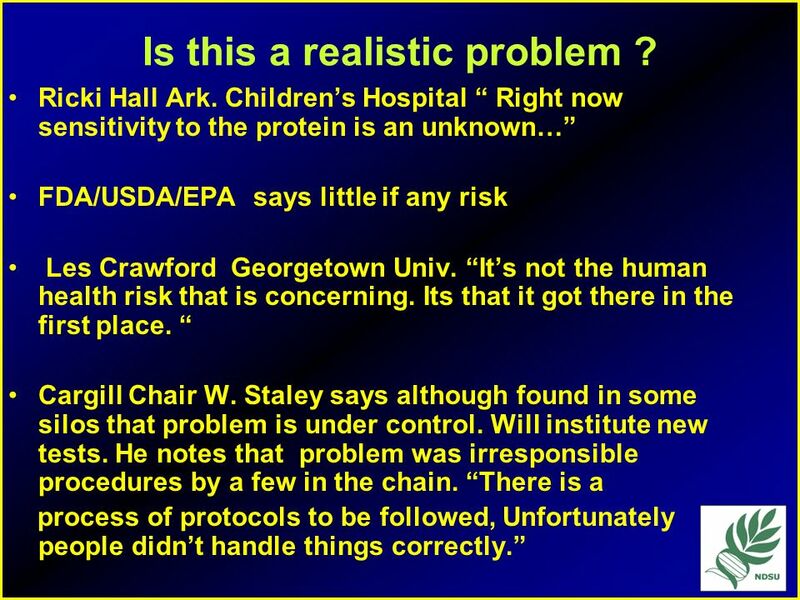 77 Is this a realistic problem ? 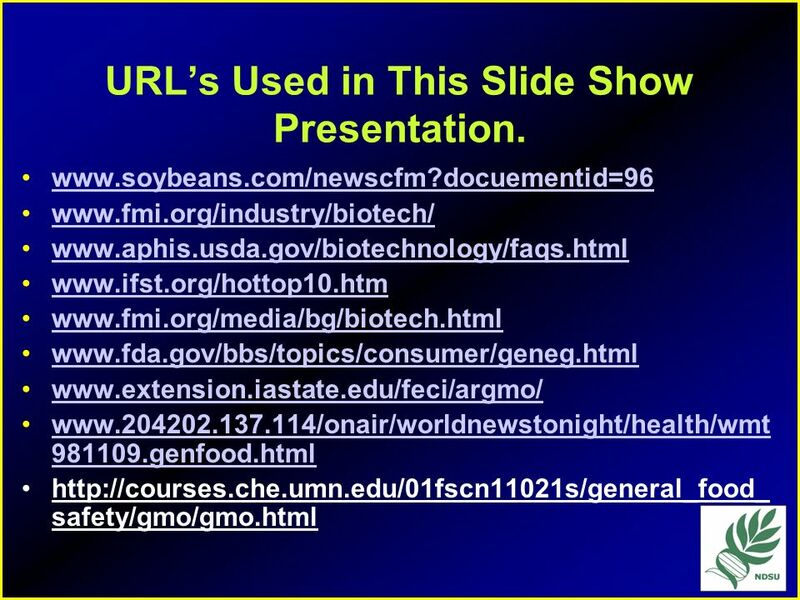 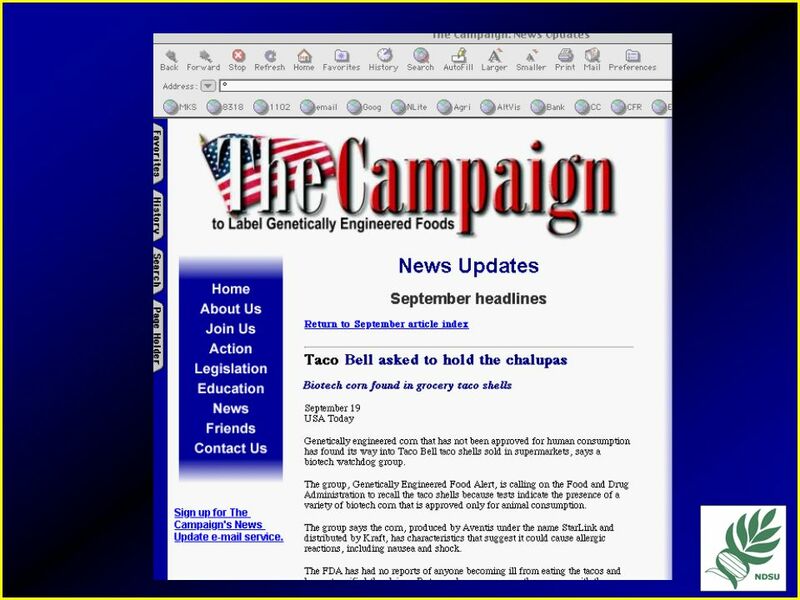 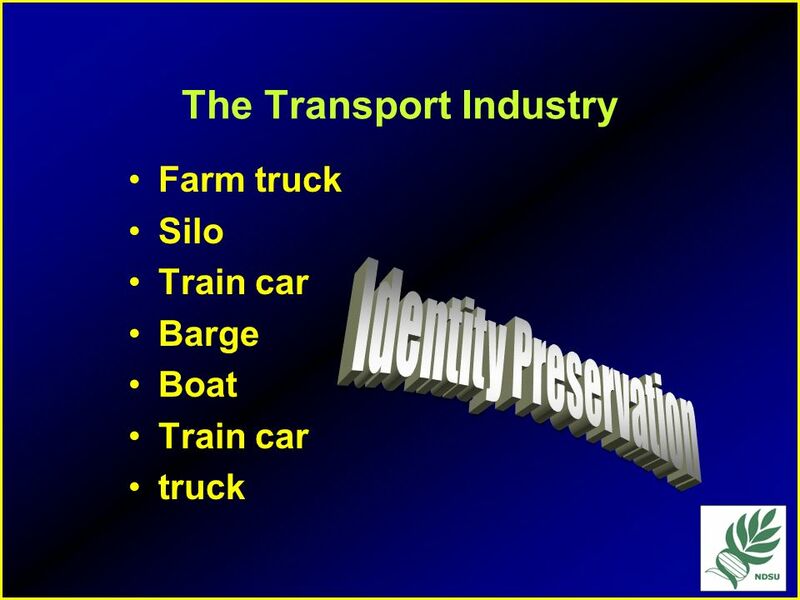 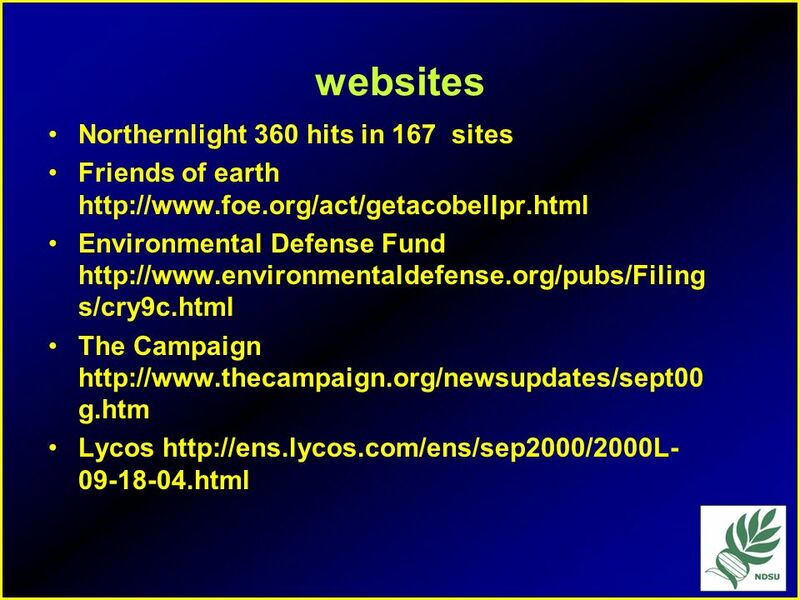 92 URL’s Used in This Slide Show Presentation. 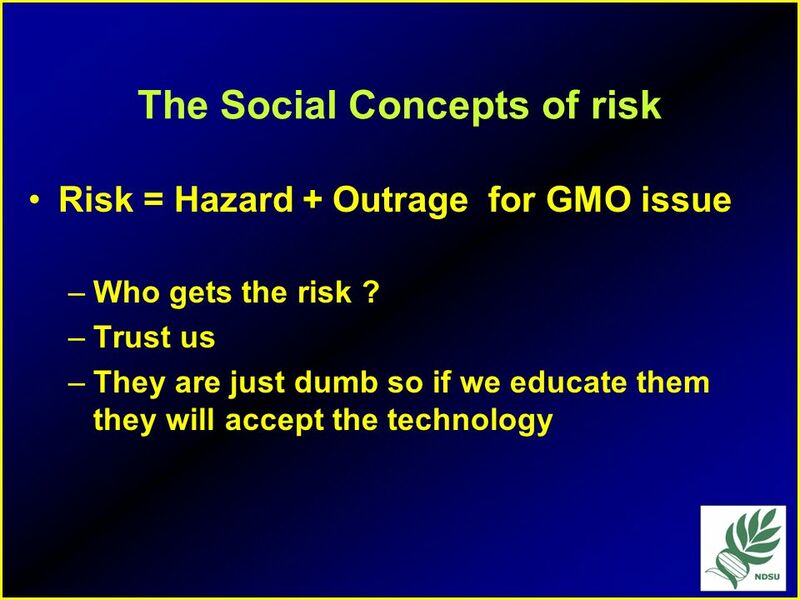 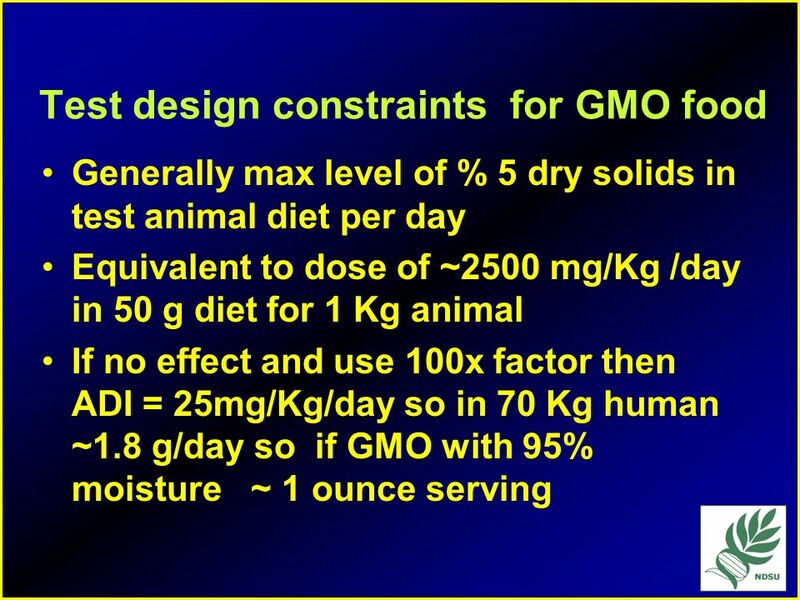 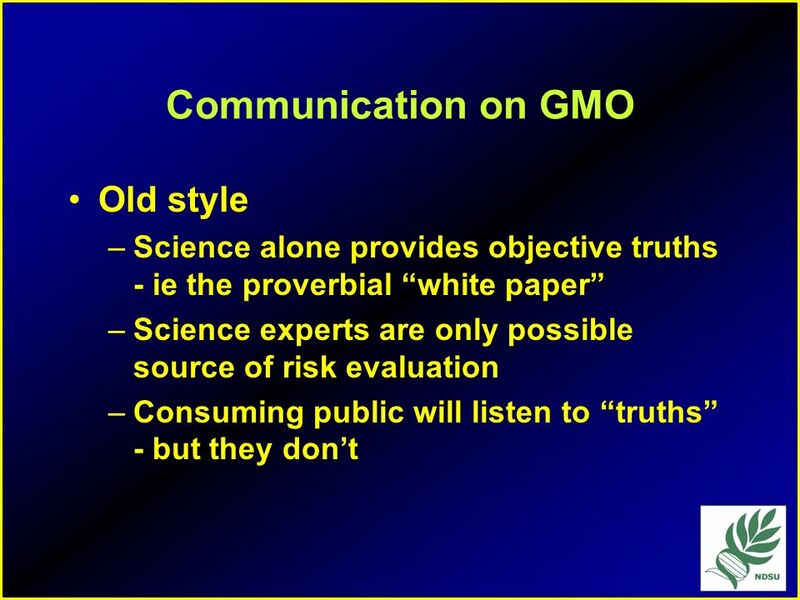 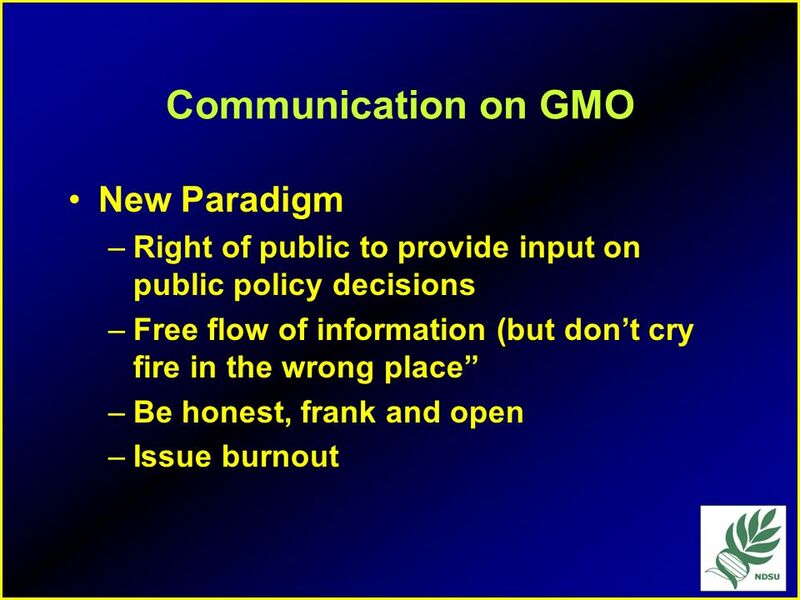 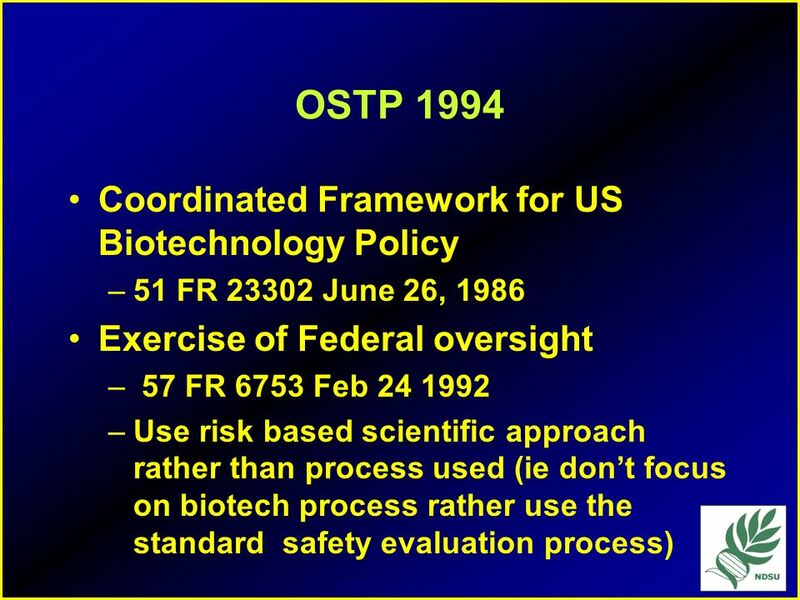 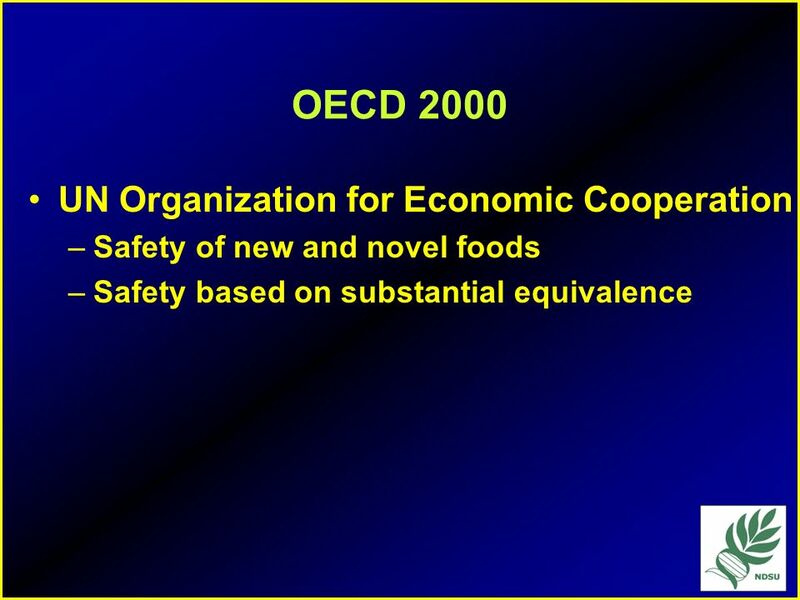 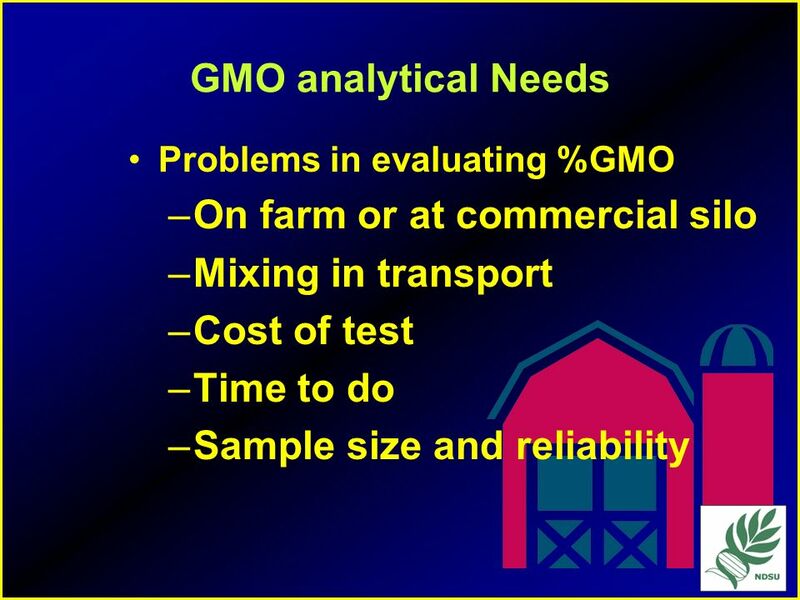 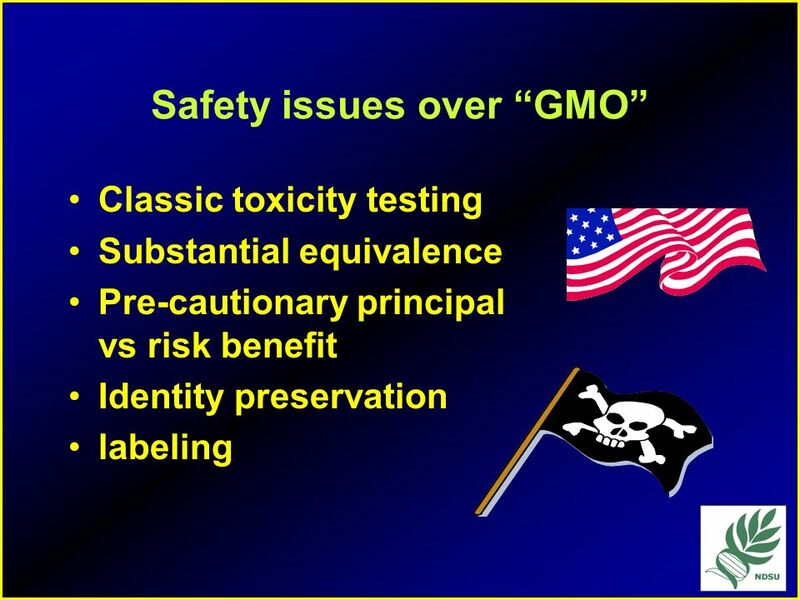 Download ppt "GMO* and Food Safety Dr. Ted Labuza"
20 years Blue Book, ISBGMO, Jeju Island Basic framework for risk assessment of transgenic plants developed by OECD: history and evolution of OECDs risk/safety. 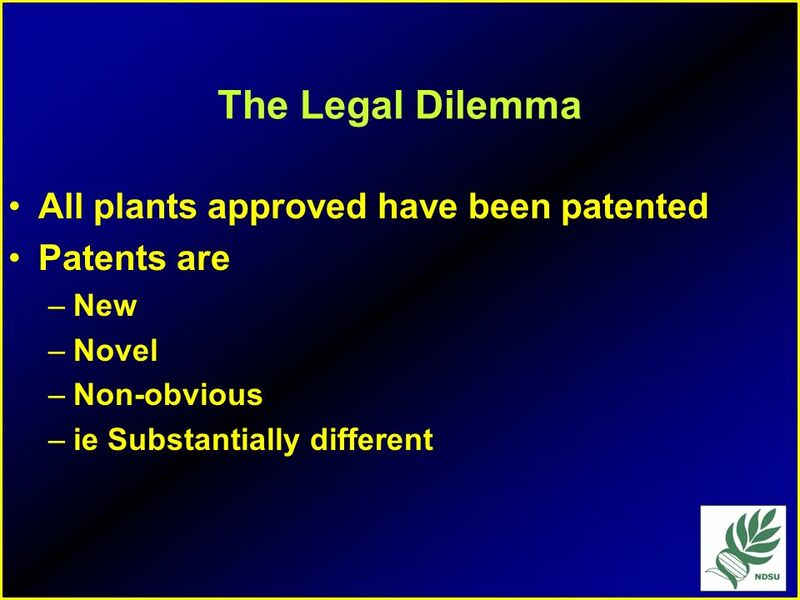 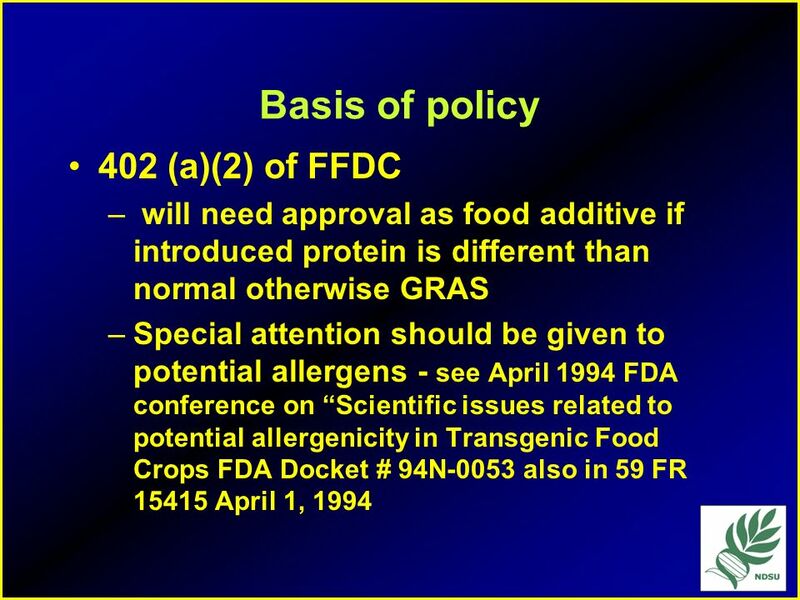 Inadequacies in the Federal Regulation of Agricultural Biotechnology Gregory Jaffe Director, Biotechnology Project Center for Science in the Public Interest. 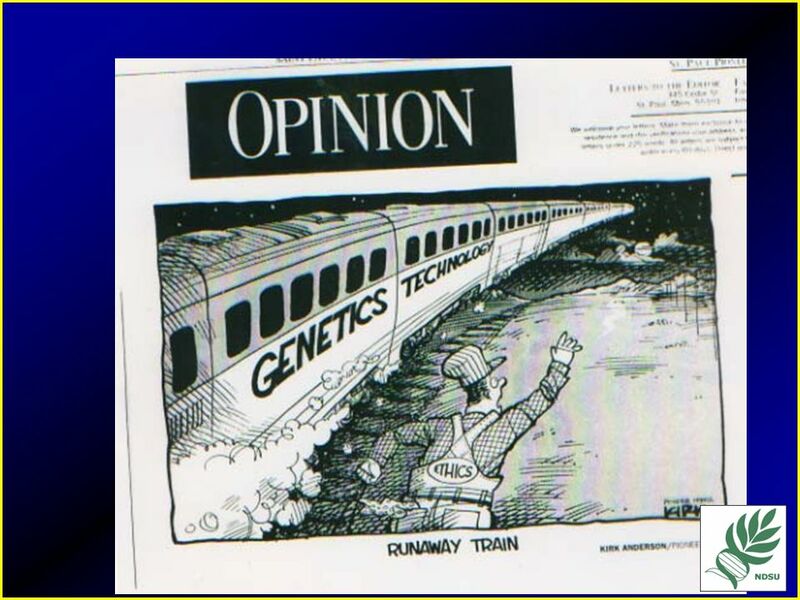 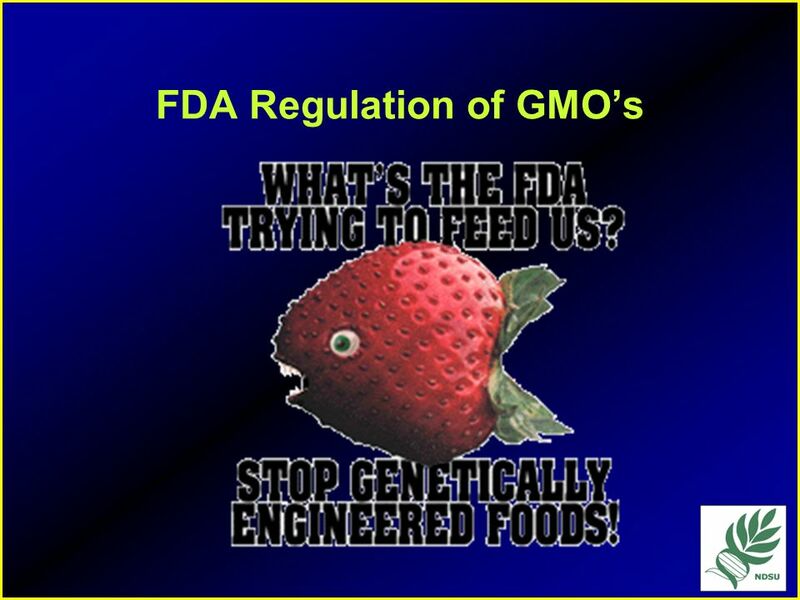 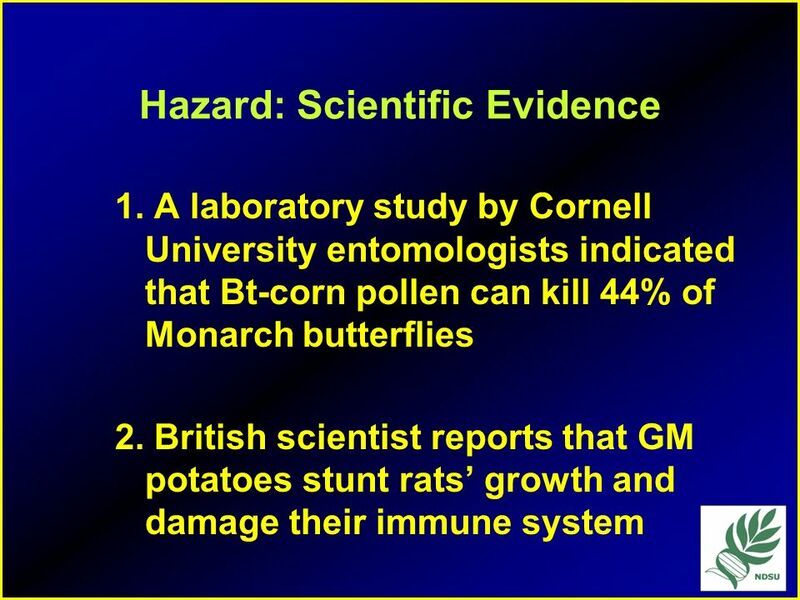 Extension.usu.edu Understanding GM Foods U.S.U. 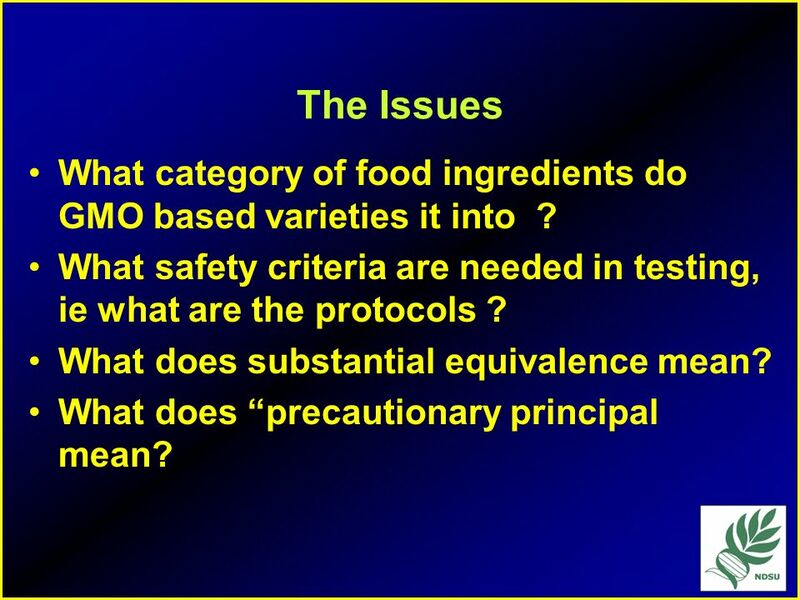 Extension Food Quality & Entrepreneurship Karin Allen, Ph.D. FACS Nutrition & Food Science Conference June. 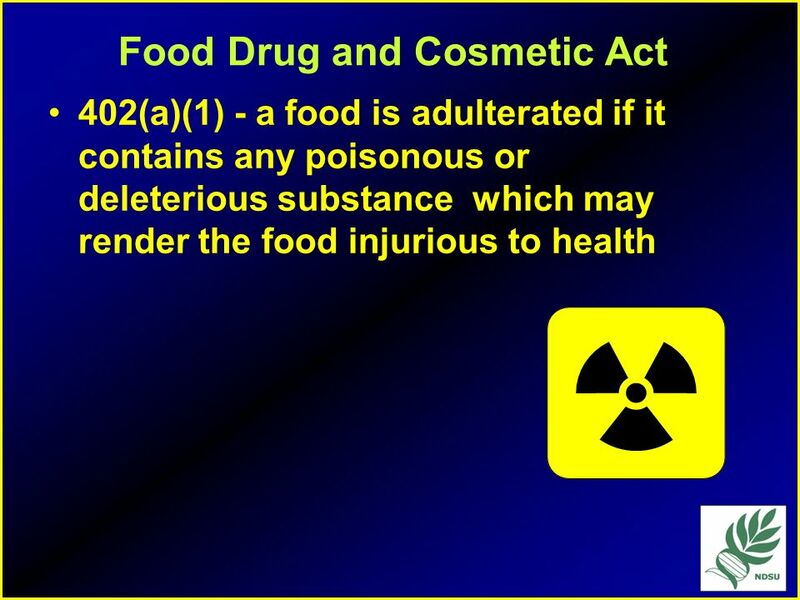 Dietary Supplements Foods or Drugs? 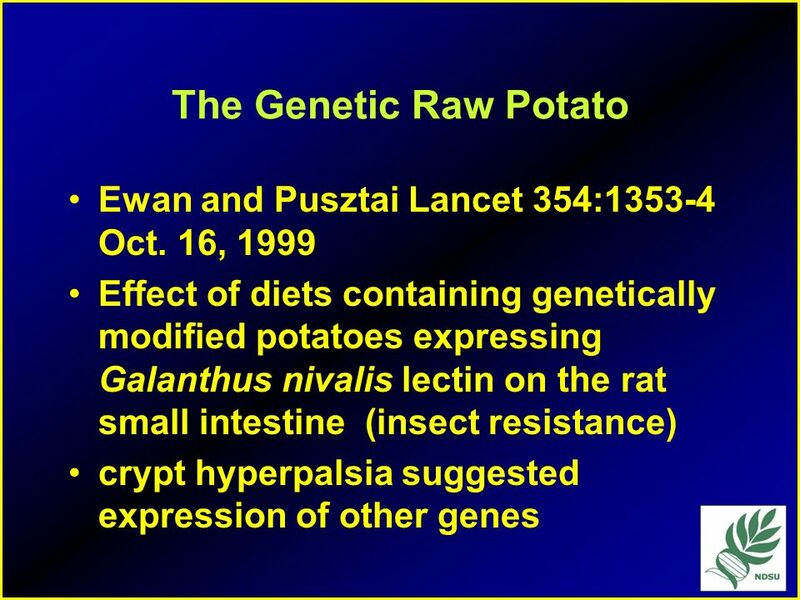 Genetically modified food Renata Zdanowska & Anna Zalewska Siedlce, 2011. 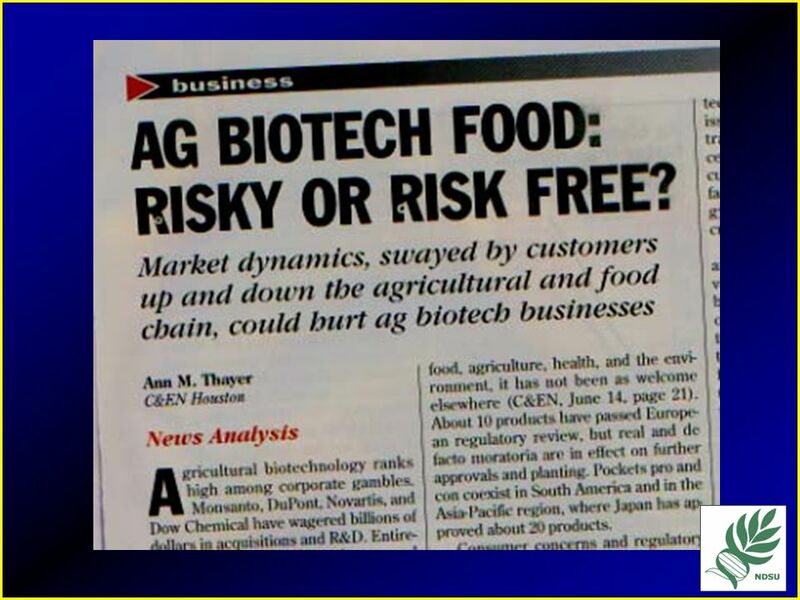 NDSU Agriculture NDSU Policy on Biotech Research & GM Wheat Update Duane Hauck Assistant Director – Ag & Natural Resources NDSU Extension Service. 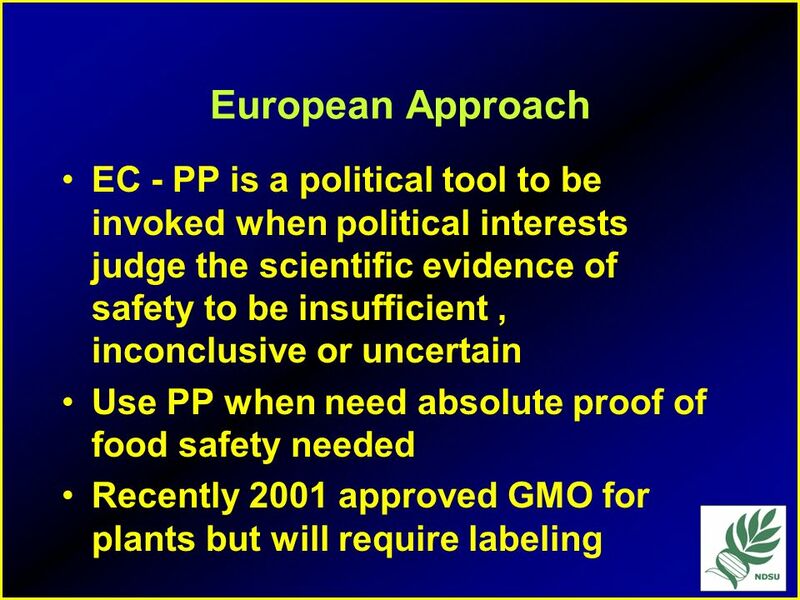 What is Agricultural Biotechnology ? 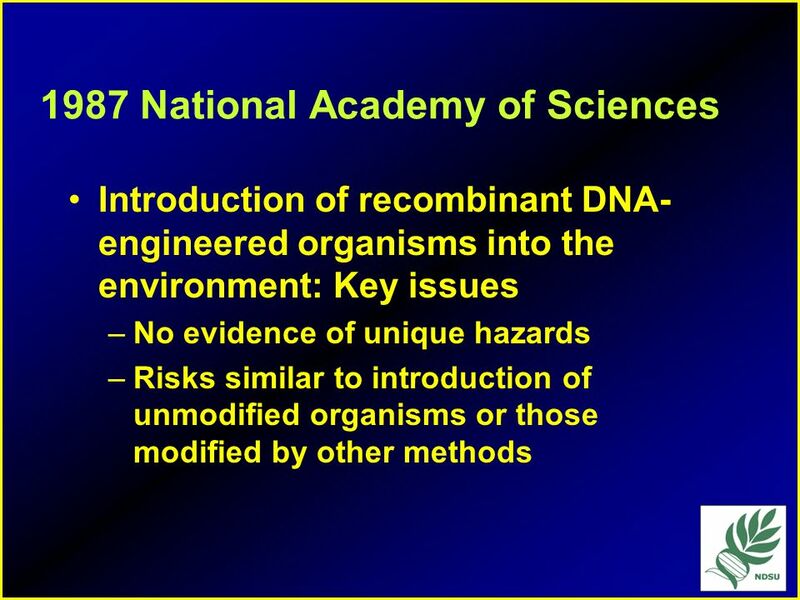 Unmodified DNA Gene of Interest Promoter Gene Marker Gene Transgenic organism. 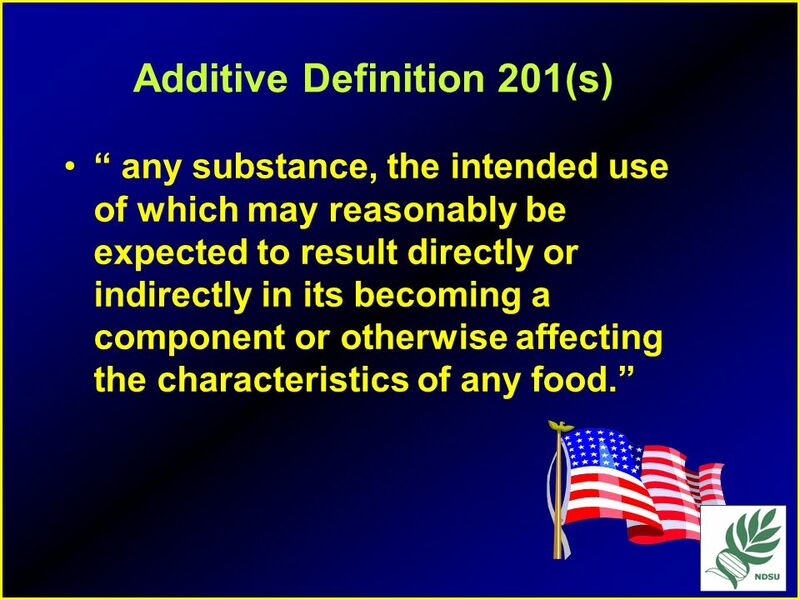 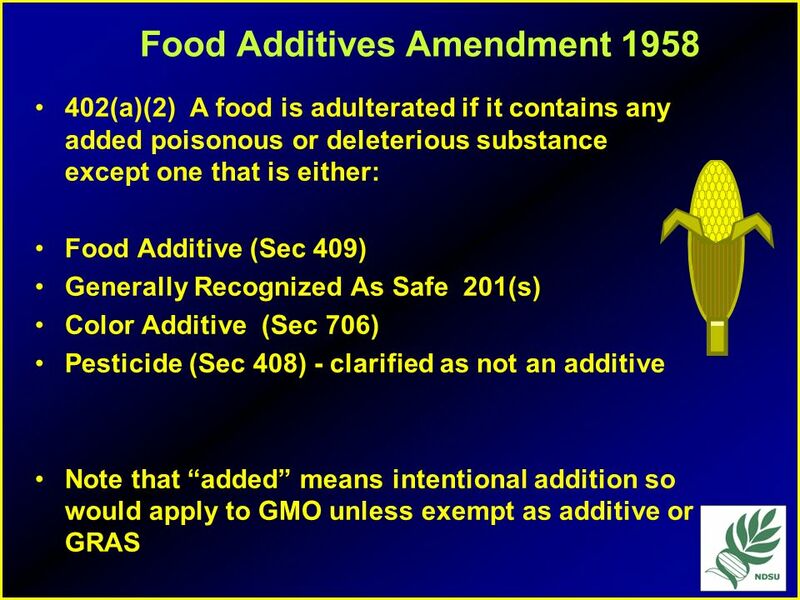 Regulating Food Additives. 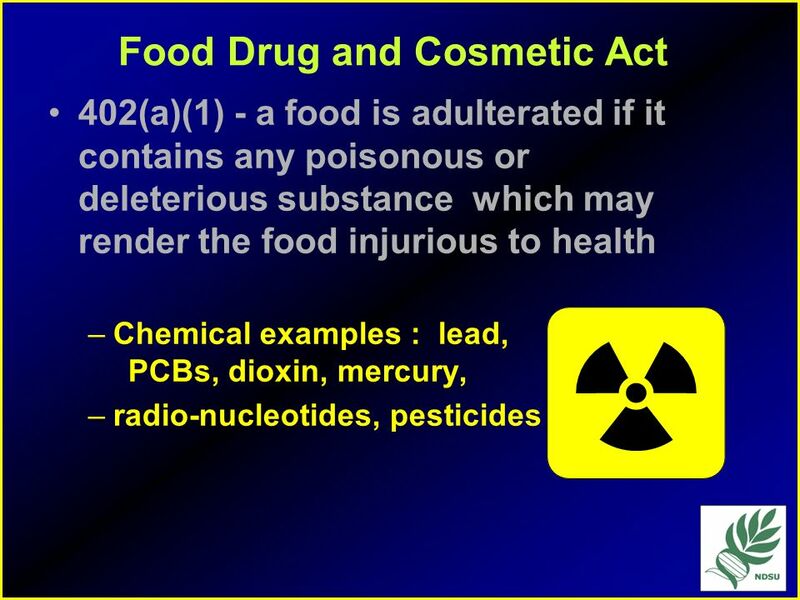 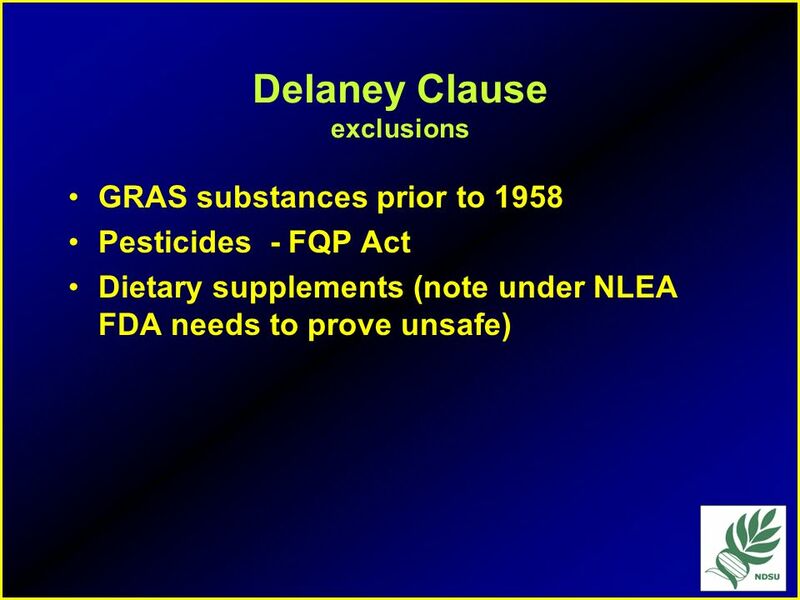 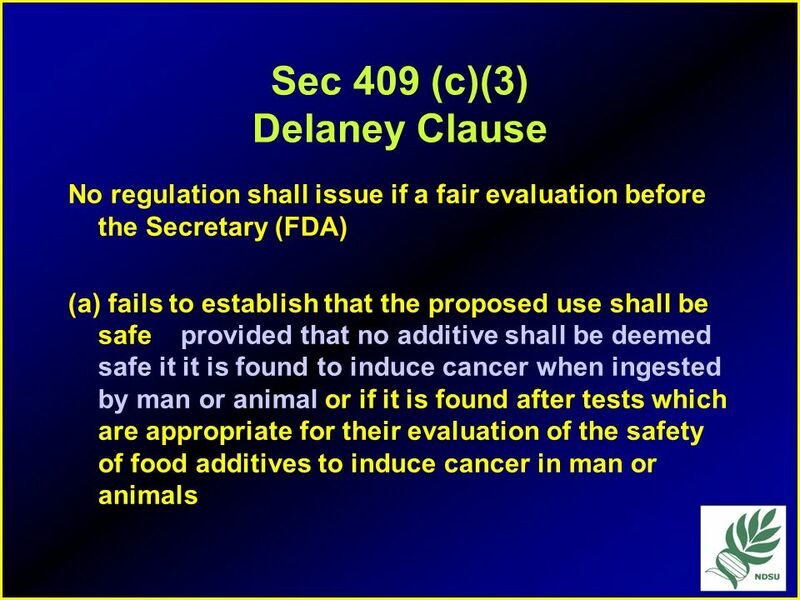 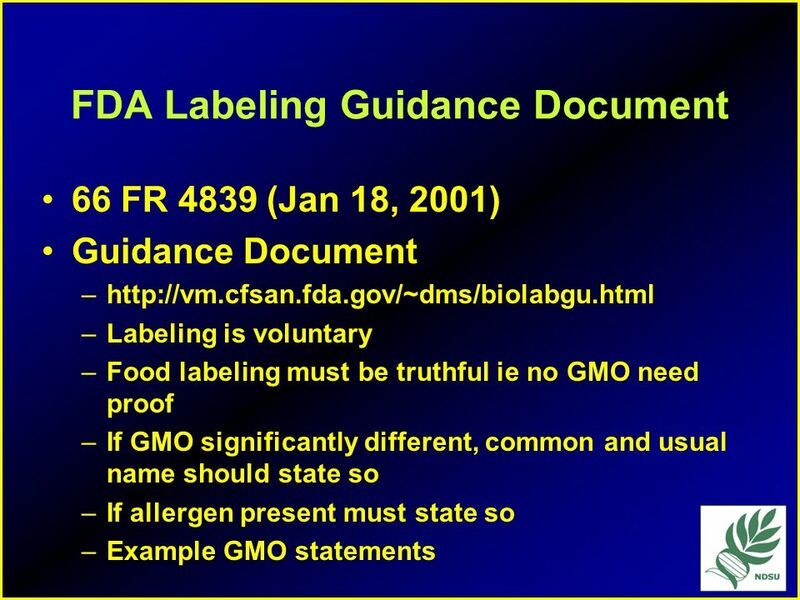 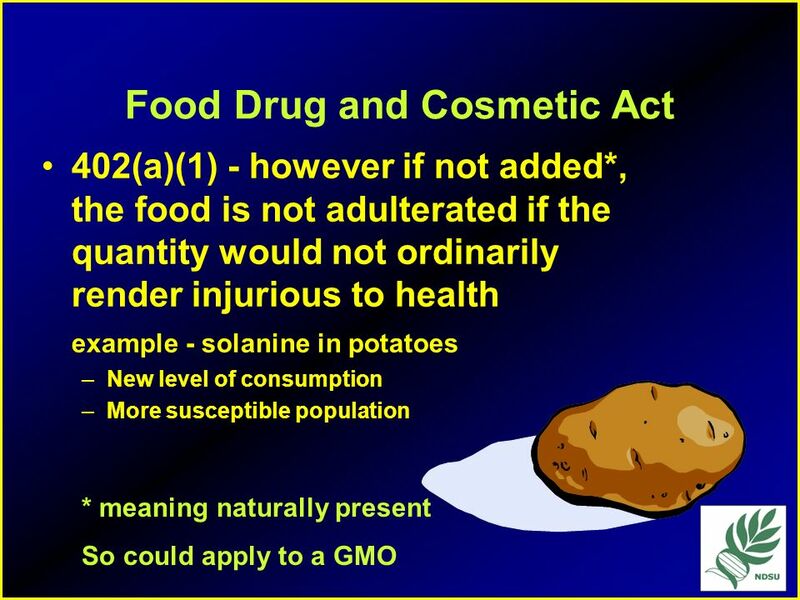 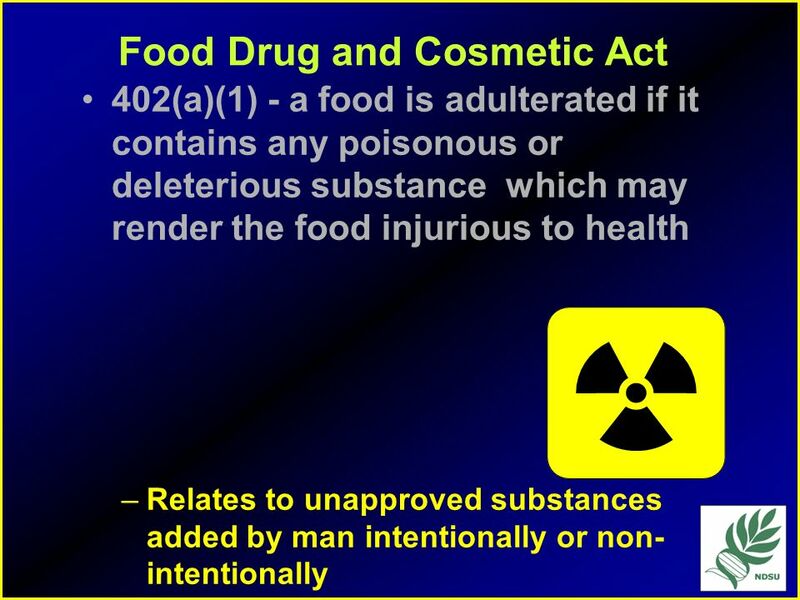 Food and Drug Administration (FDA) 1938 – Federal Food, Drug, and Cosmetics Act Authority over food and food ingredients Defined. 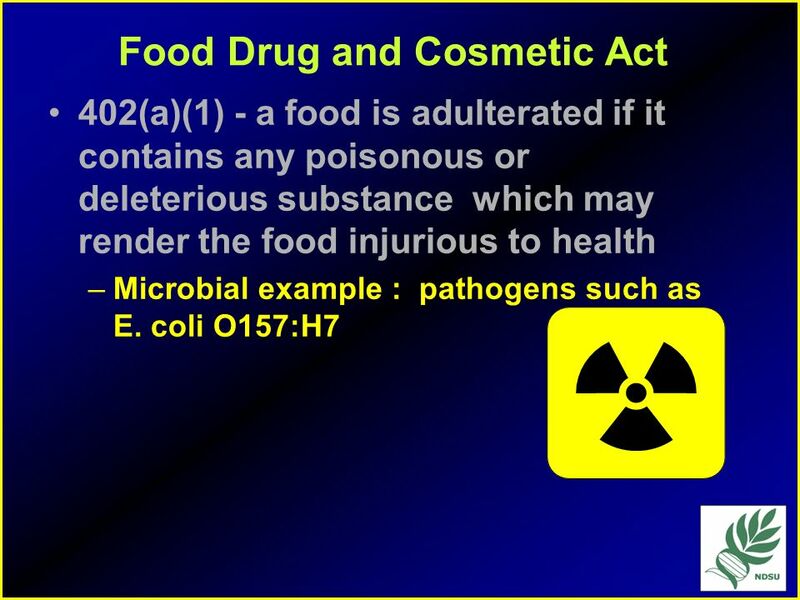 CONFERENCE ON “ FOOD ADDITIVES : SAFETY IN USE AND CONSUMER CONCERNS“ JOMO KENYATTA UNIVERSITY OF AGRICULTURE AND TECHNOLOGY NAIROBI, 24 JUNE 2014. 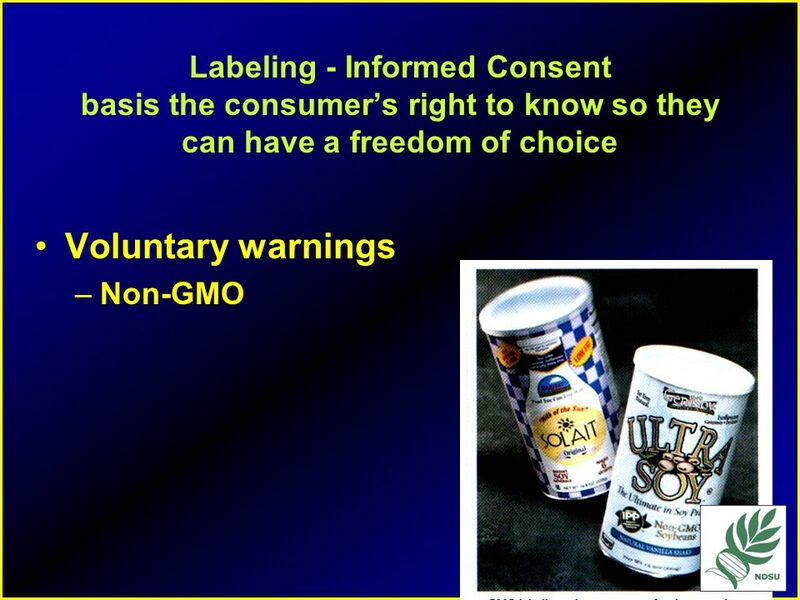 Are They Safe? 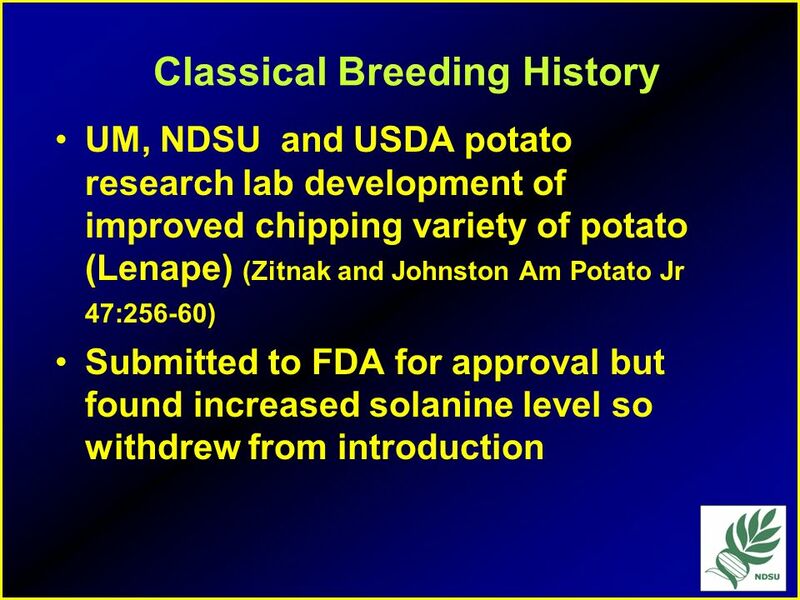 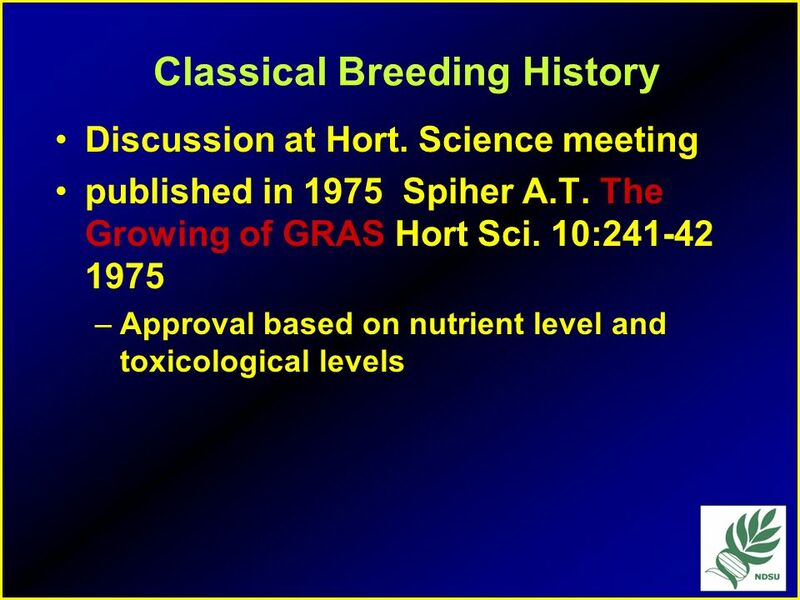 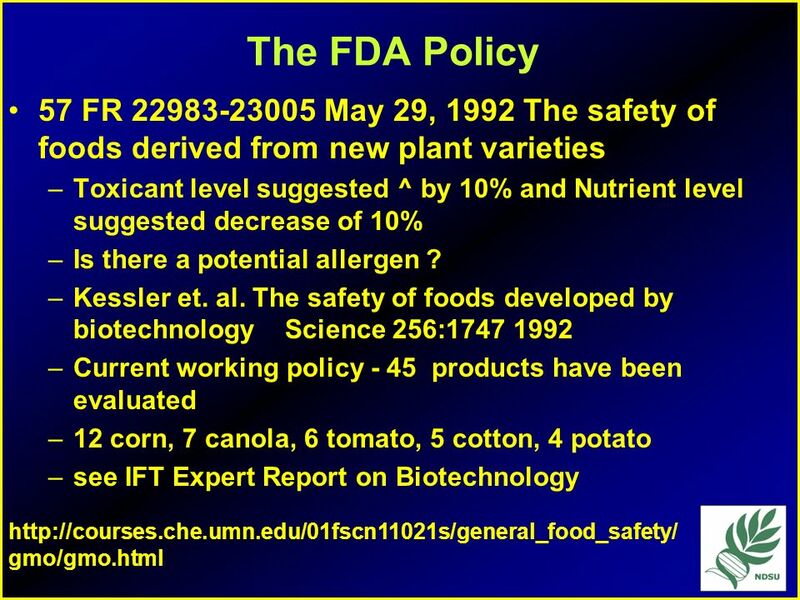 Biotech Food Crops and Products February 1, 2002 Karen Pesaresi Penner Kansas State University Food Science Institute. 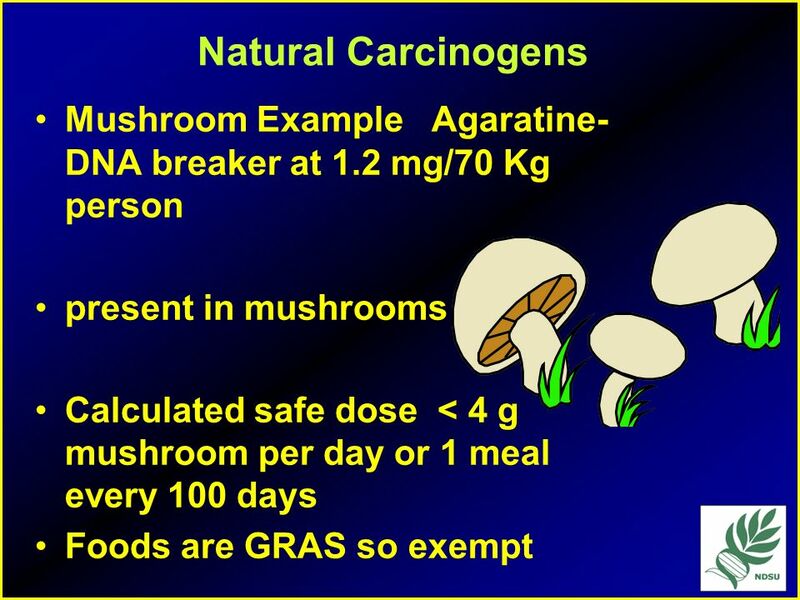 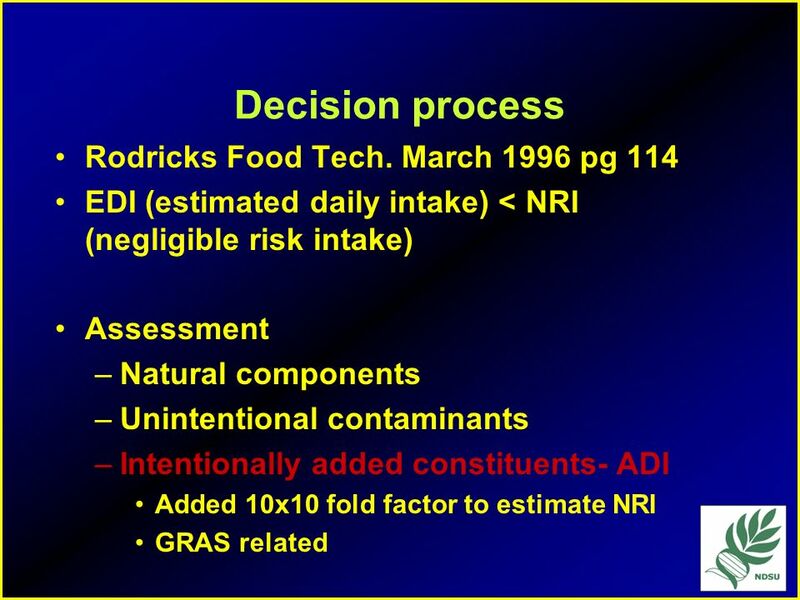 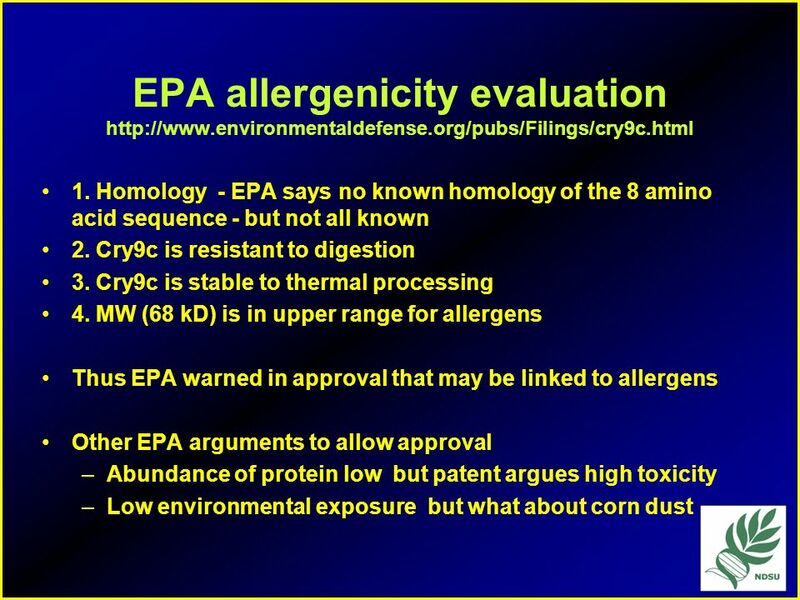 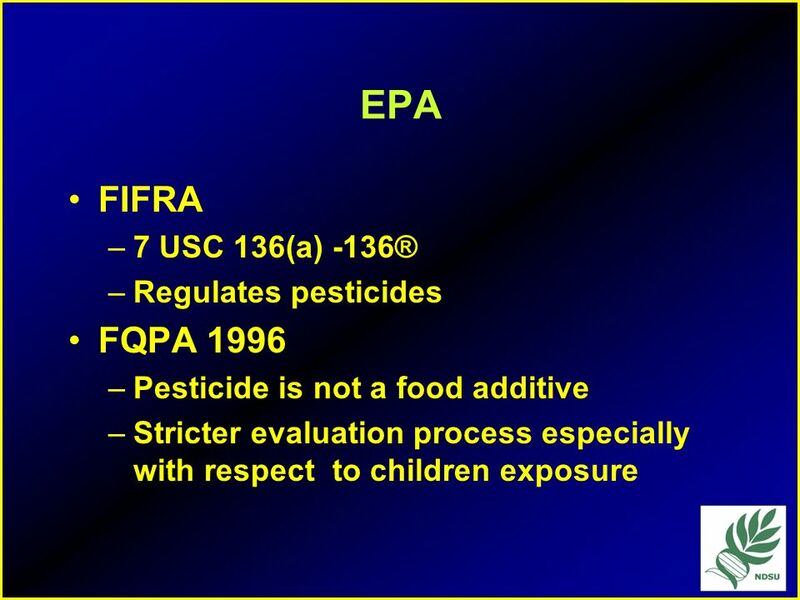 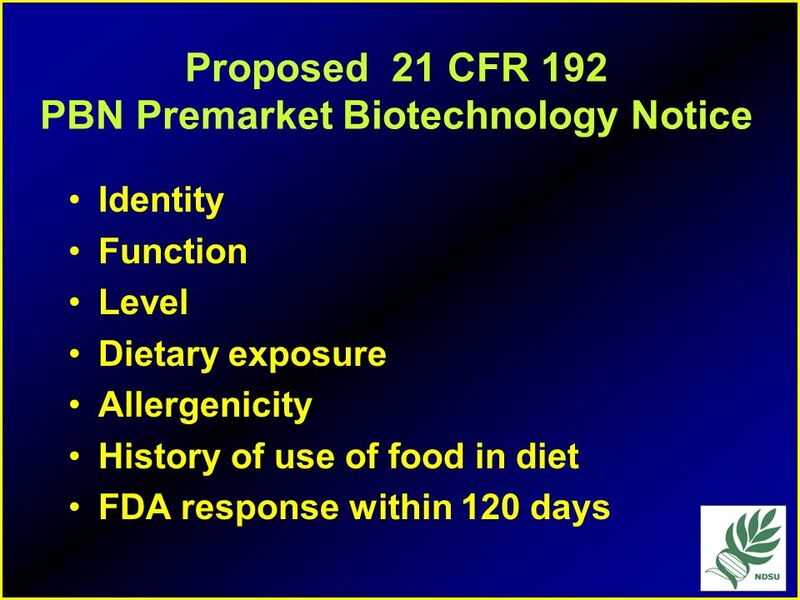 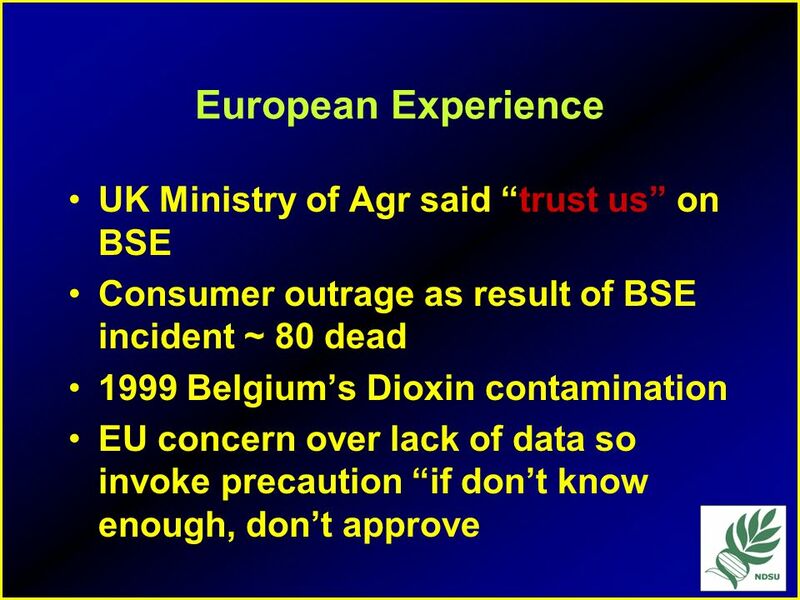 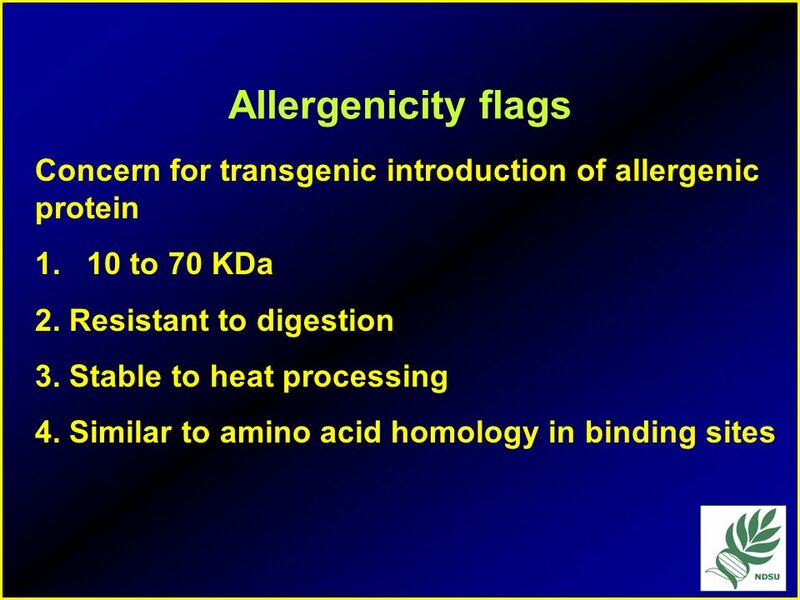 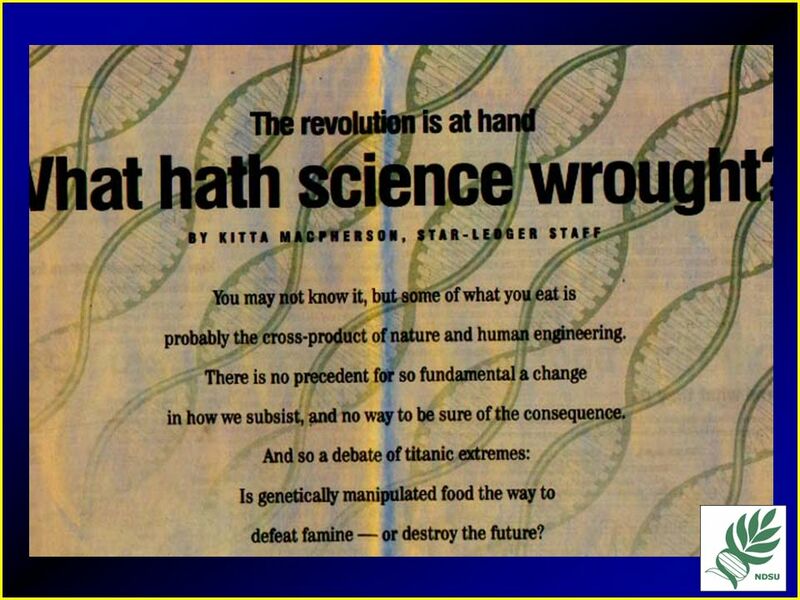 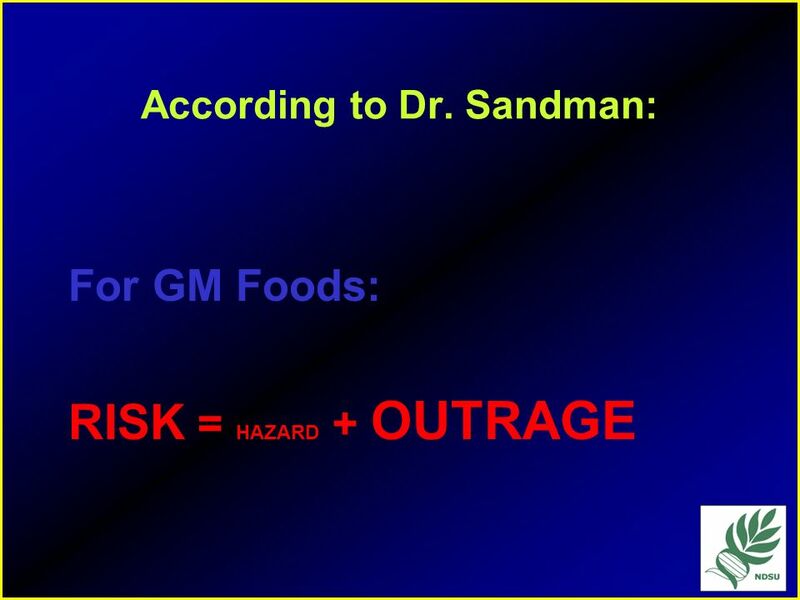 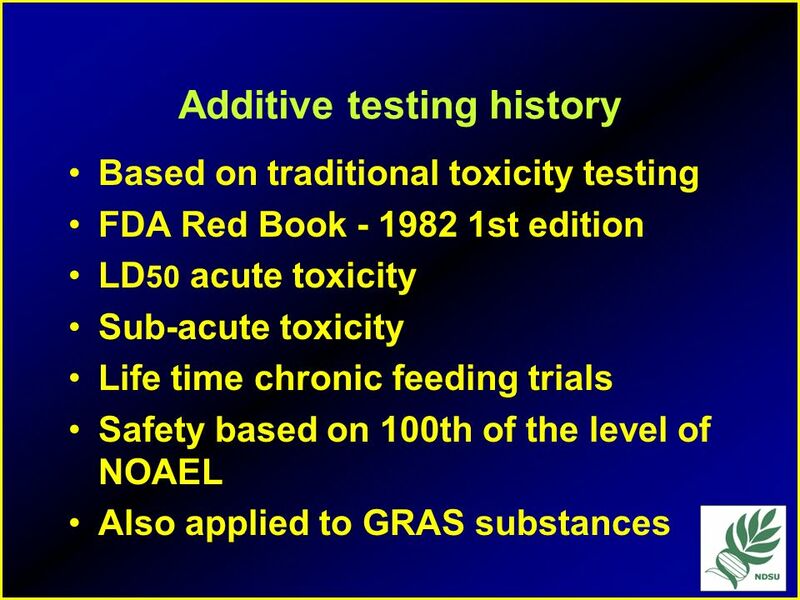 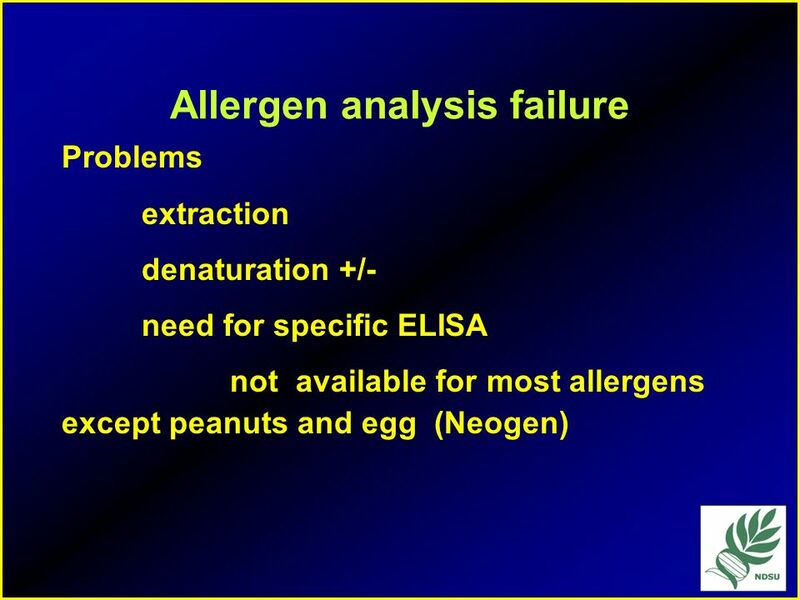 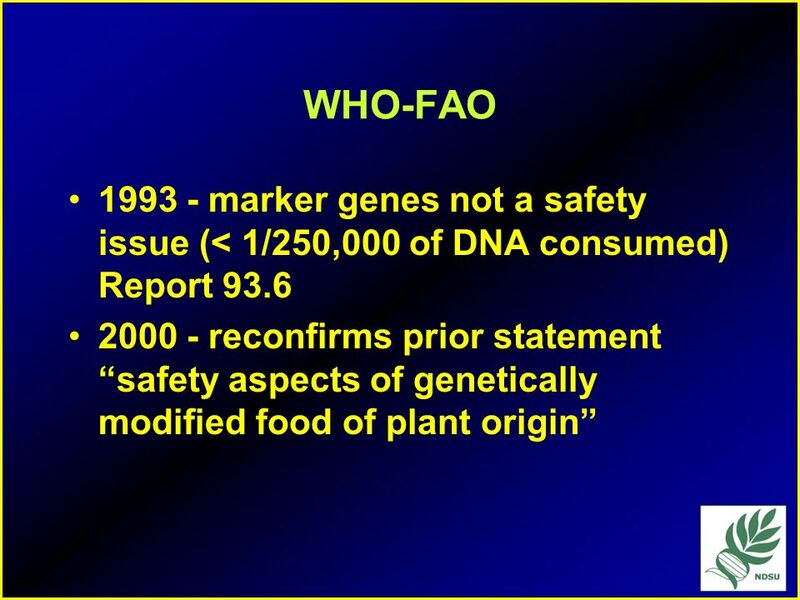 No peer-reviewed food safety tests Creation of allergens or activation of toxins Pharma crops contaminate food supply Changes in nutritional content Gene. 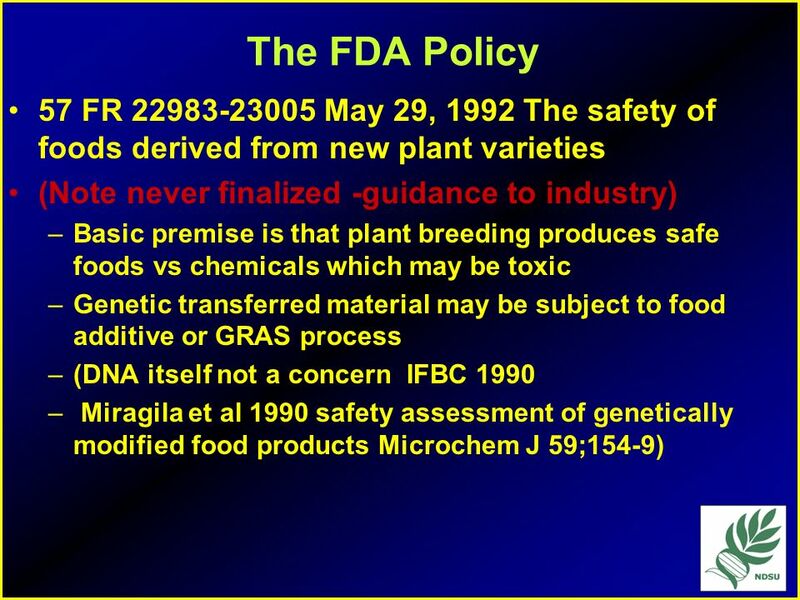 Regulation and Safety Assessment of Novel Foods in Canada William Yan, Ph.D. Office of Food Biotechnology Health Canada. 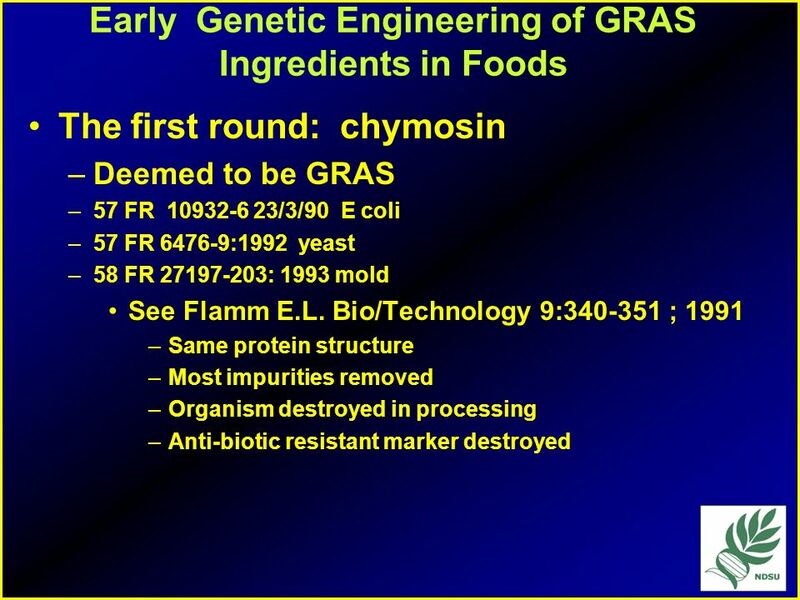 Genetically Modified Organisms Interactions with Population Health and Safety Chelsea Kadish Tyler Vaughn Ashley Wright. 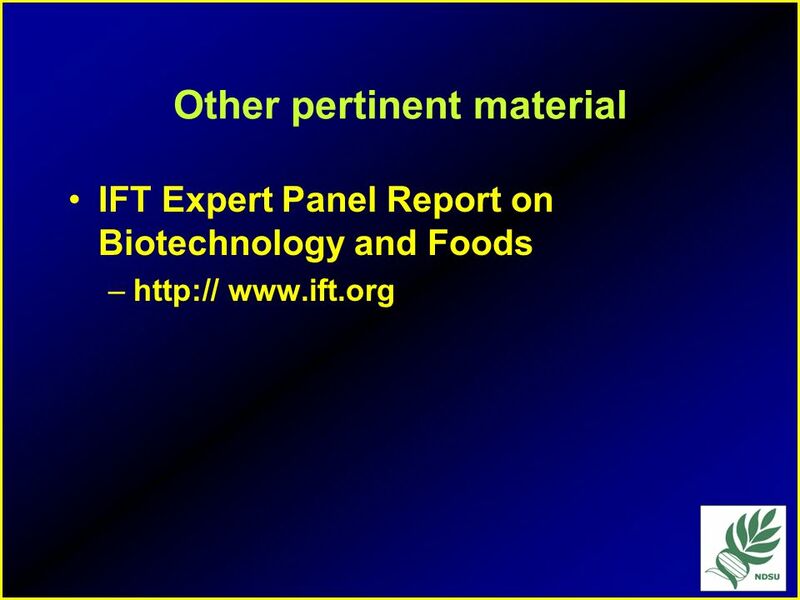 What Biotech IS… Look at this stuff! 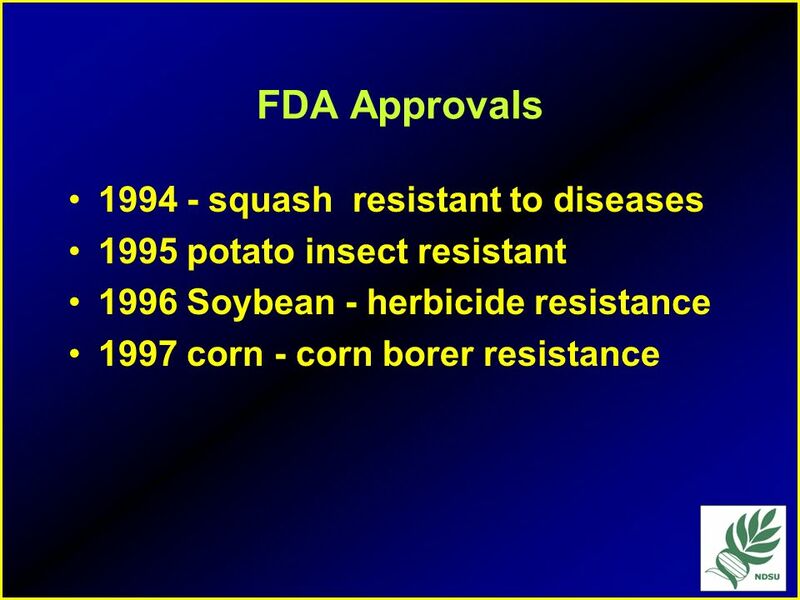 These things are all products of biotechnology. 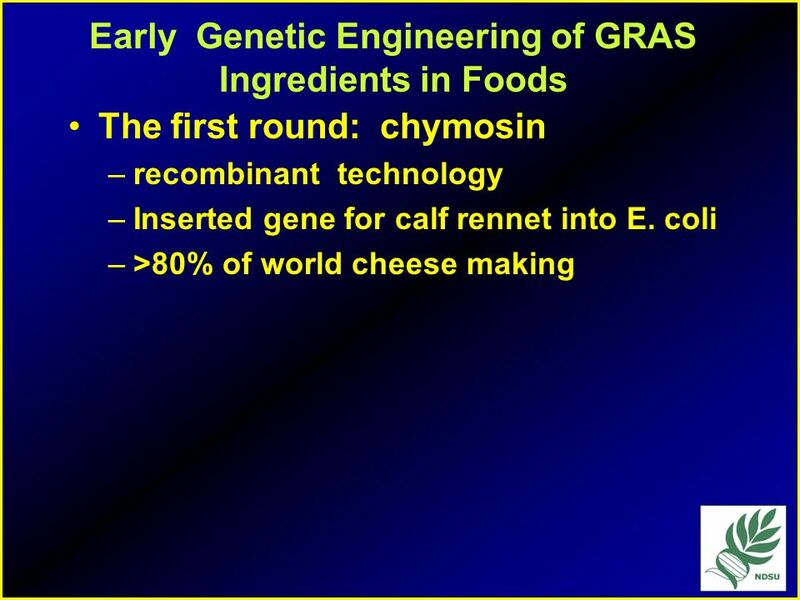 Beer & Wine: Yeast is used in the fermentation process during the. 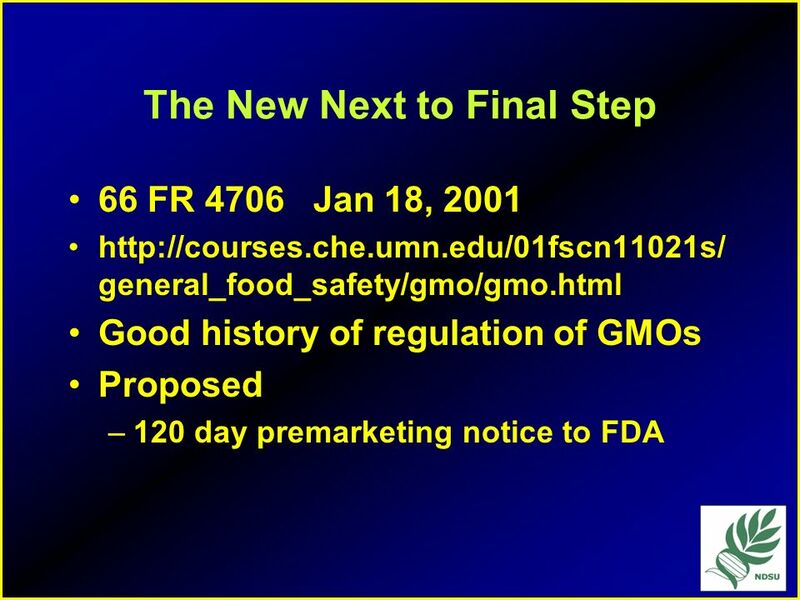 Genetically Modified Foods Beth Roberson November 19, 2004 FST 490.